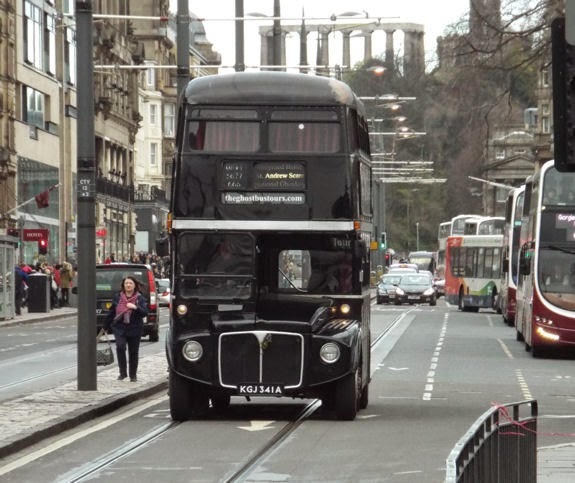 Trams had almost disappeared from the streets of British towns and cities by the early 1960s. 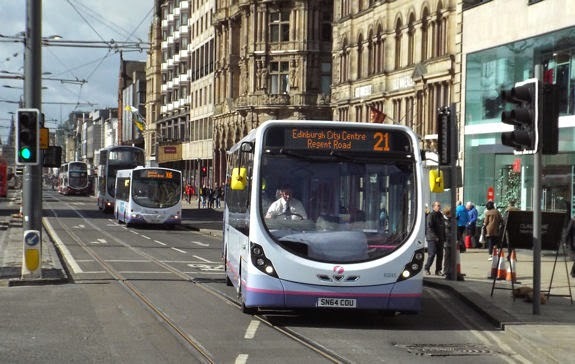 Only one town, Blackpool on England's north west coast, held on to its trams. 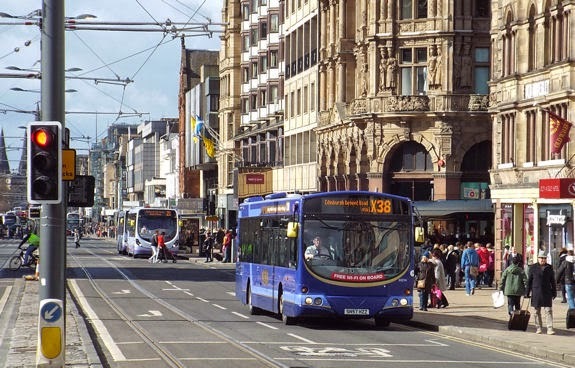 Since the early 1990s, trams have been reintroduced to a small number of cities in England. 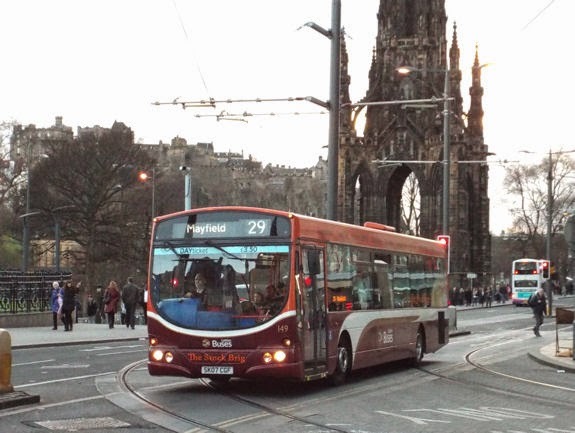 In 2014 Edinburgh became the latest British city, and the only city in Scotland, to open a new tram system. 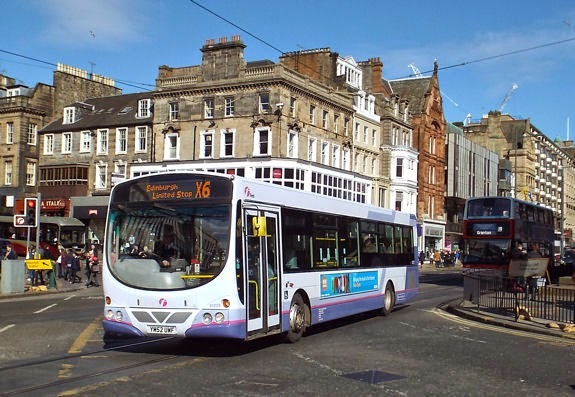 A single route operates, running westwards from Edinburgh City Centre to the airport. 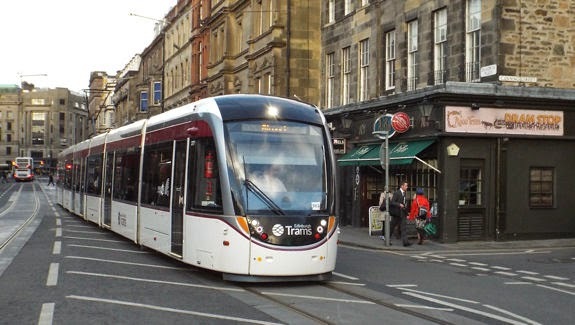 The system runs at a relatively modest frequency of a tram generally every 8-10 minutes. 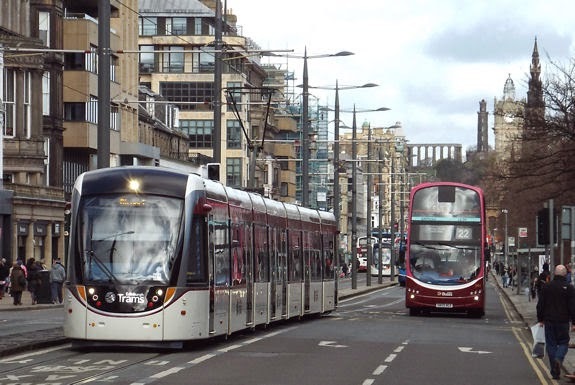 In the centre of Edinburgh, trams run on-street. 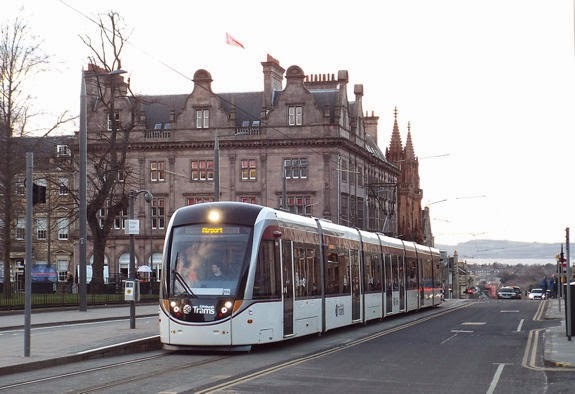 Outside the city centre, the trams run on segregated track. 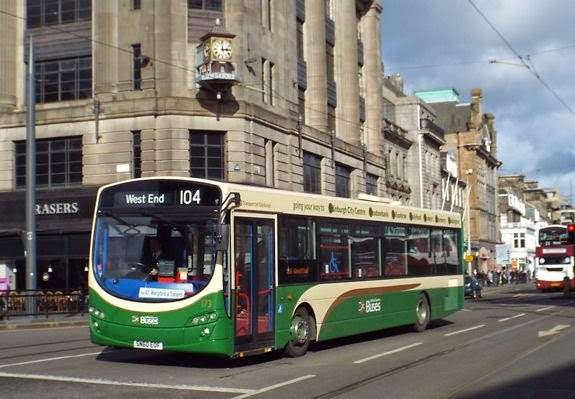 The city centre terminus is at York Place, in the centre of a busy street. 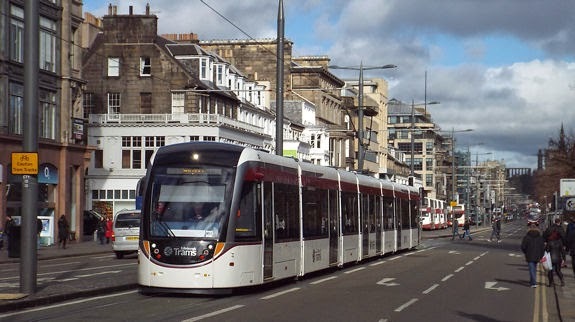 The original plans for the tram envisaged a cross-city route, carrying on from the city centre to the Leith district. The project was scaled back due to overrunning costs. 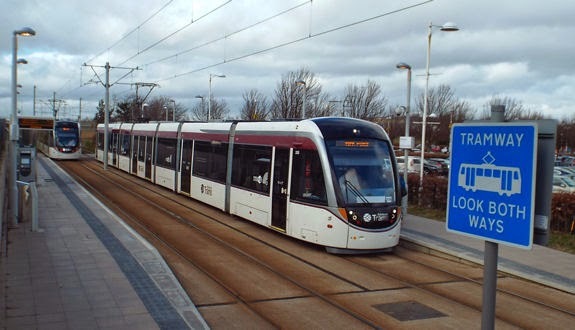 A single journey on the tram costs £1.50, except for travel to and from the airport where a £5 fare applies. 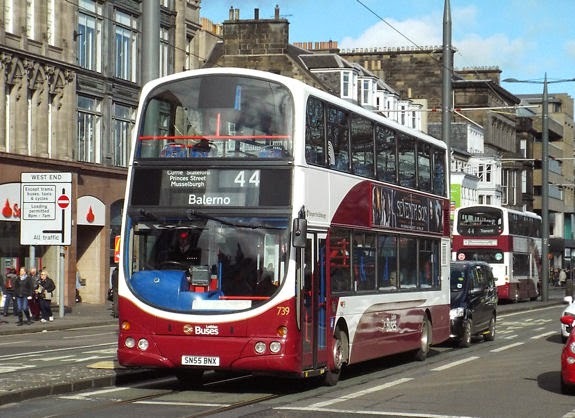 All-day and longer period tickets allowing unlimited travel are available. Although tickets are checked on board, they are not sold by on-board staff. Tickets must be bought from machines at tram stops. The ticket vending machines require the exact fare, as they do not give change. 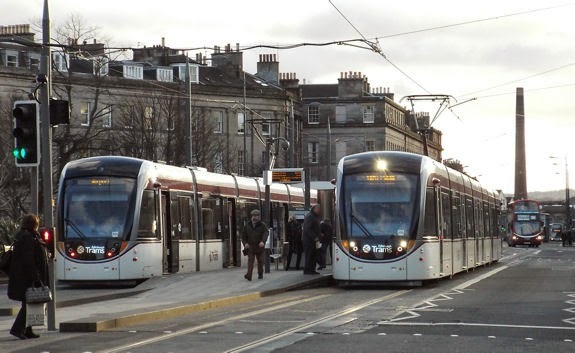 The Edinburgh Trams website provides information about the tram service. 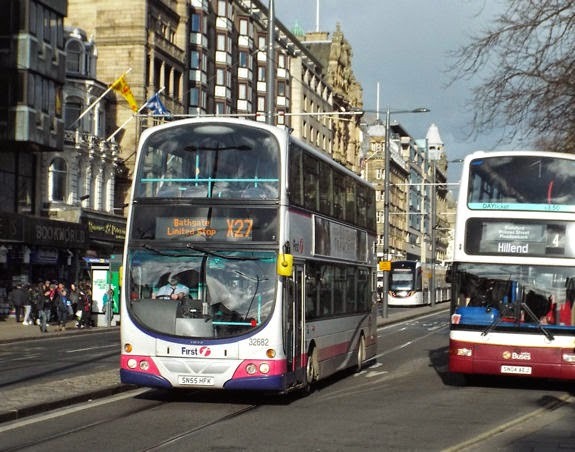 As well as trams, large numbers of buses converge on Edinburgh's city centre. 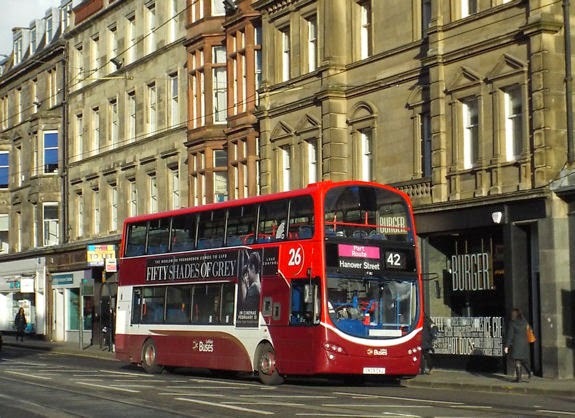 Most of the city services are operated by Lothian Buses. 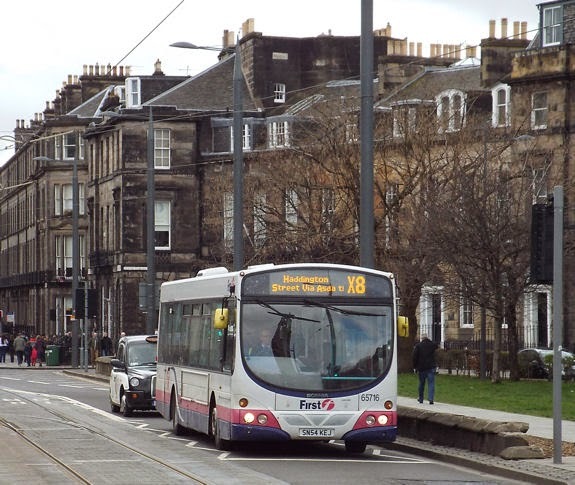 Like the trams, Lothian Buses is in local authority ownership, under the umbrella of Transport for Edinburgh. 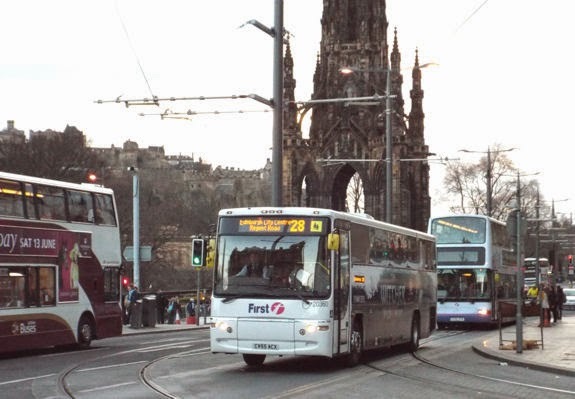 However, there appears to have been little attempt to integrate the bus and tram systems. 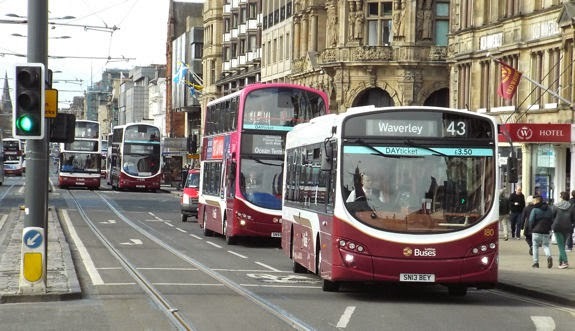 Transfer tickets permitting interchange between bus and tram for the price of a single journey are not available, and the opportunity to redesign the bus network in the west of the city to feed the tram system has not been taken. 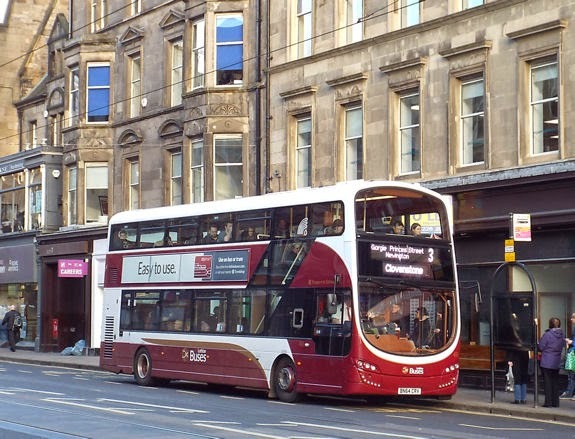 The Lothian Buses fleet includes large numbers of double-deck buses. 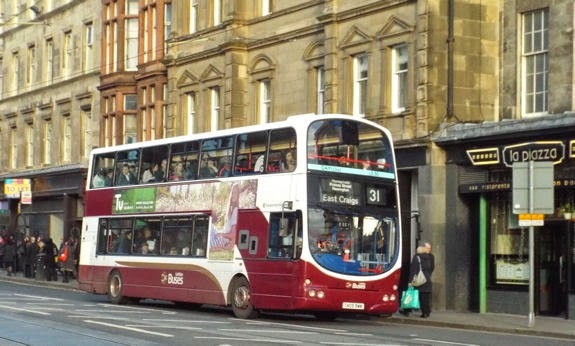 Some of the older vehicles wear this "harlequin" livery. 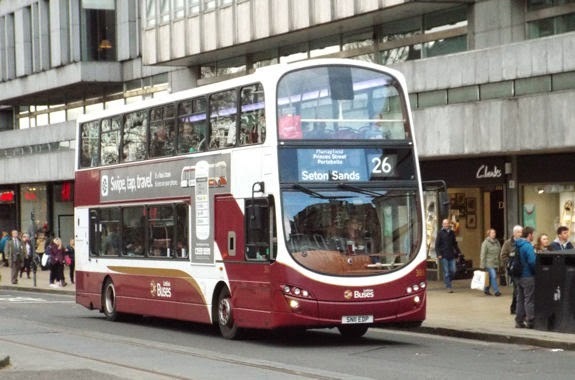 Otherwise, the buses generally carry maroon and white colours. 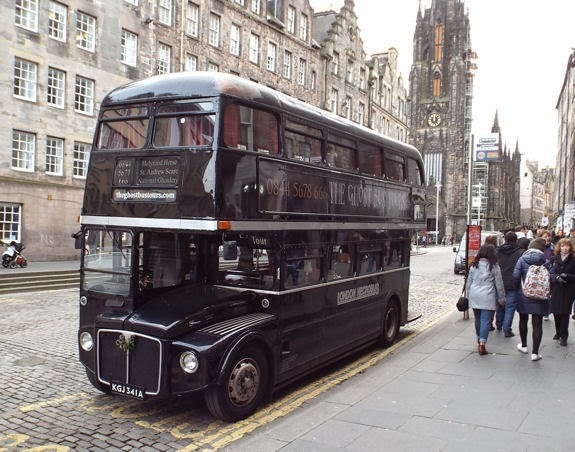 On the latest double-deckers, the staircase is glazed rather than plain-panelled. 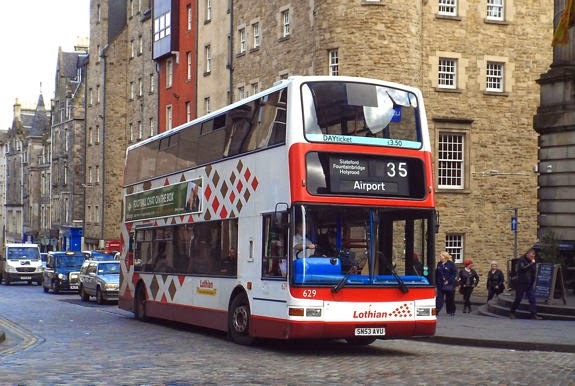 Lothian operates a small batch of hybrid-powered double-deckers. These carry a modified colour scheme, with a metallic greyish green in place of white. 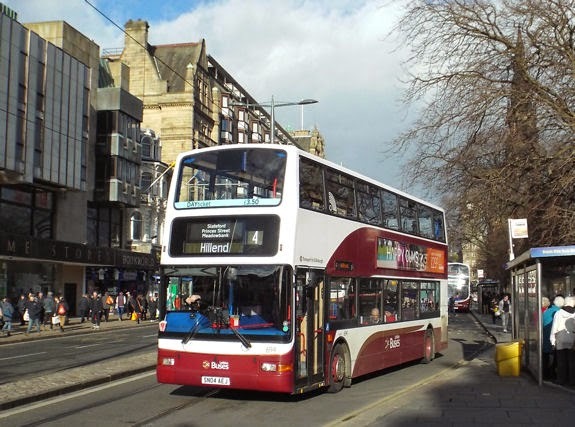 Lothian Buses also operate a number of single-deck vehicles into the centre of Edinburgh. 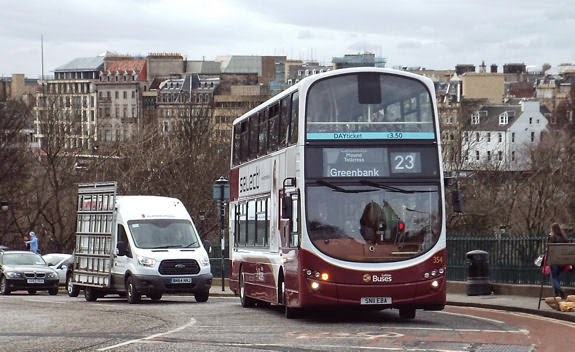 As well as conventional diesel-powered buses, hybrid single-deckers are also very much in evidence. 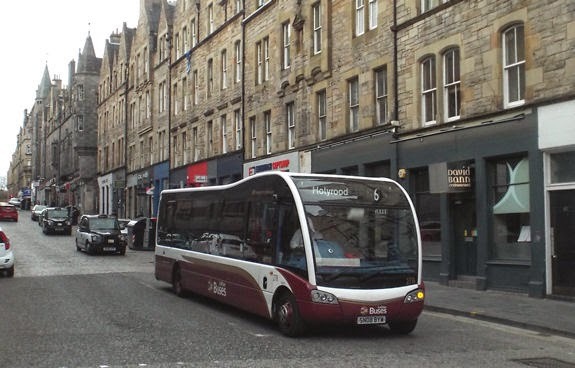 ... but at least one carried a special scheme for an Edinburgh-based financial services company. 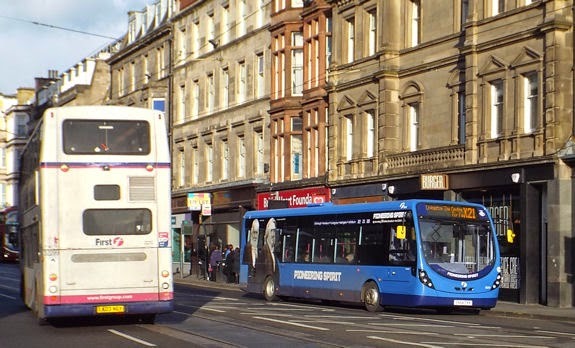 Route 61 links a number of the company's offices in Edinburgh. 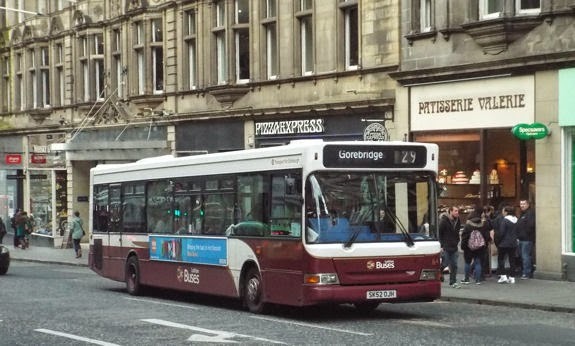 This was the only Lothian Buses vehicle I spotted carrying all-over advertising for a commercial sponsor. 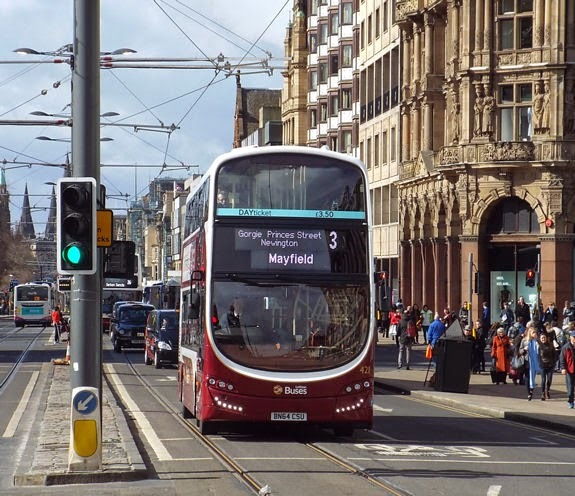 It is notable that, whereas the route details displayed on double-deck buses usually included some of the key intermediate points served, single-deck buses displayed only the route number and final destination. 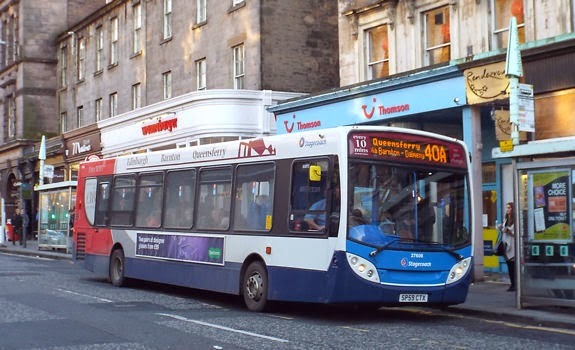 On double-deckers, the front displays are sometimes used to draw attention to particular types of service rather than displaying intermediate points. 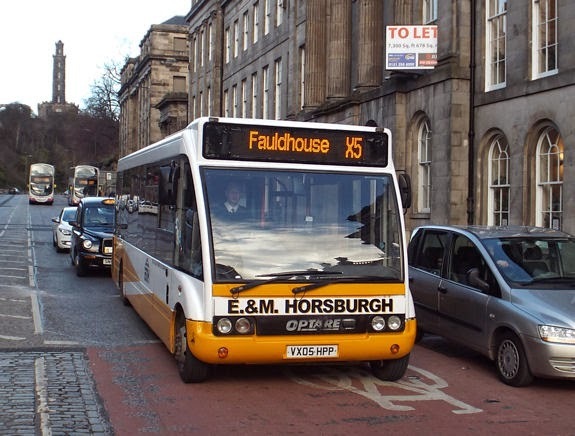 Certain bus routes serve Park & Ride sites on the outskirts of Edinburgh. 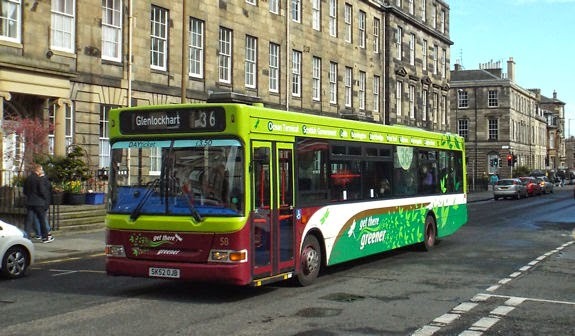 A green display denotes a route which provides a Park & Ride facility. 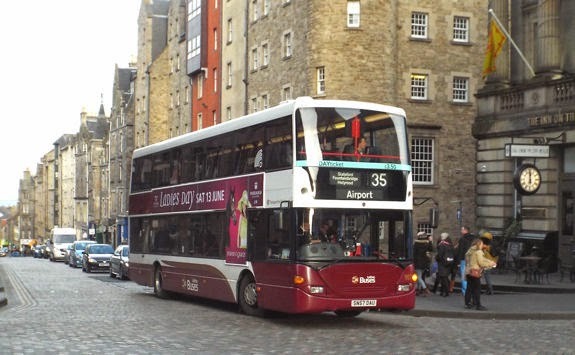 Lothian Buses operate a number of limited stop services at peak commuting times. In some cases (but not all), these can be identified by yellow displays. 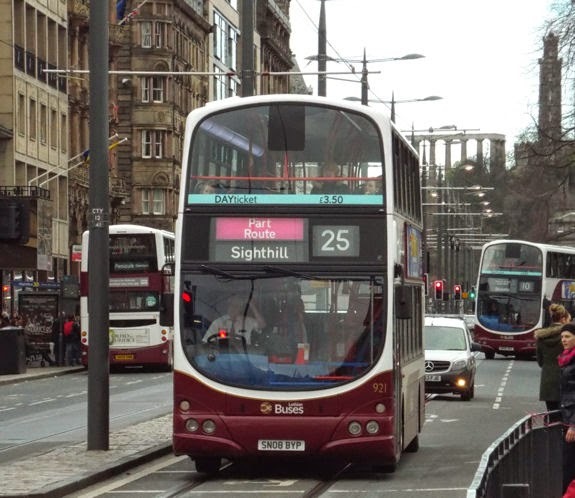 In this image, the "limited stop" message is repeated using a slipboard in the bus windscreen. 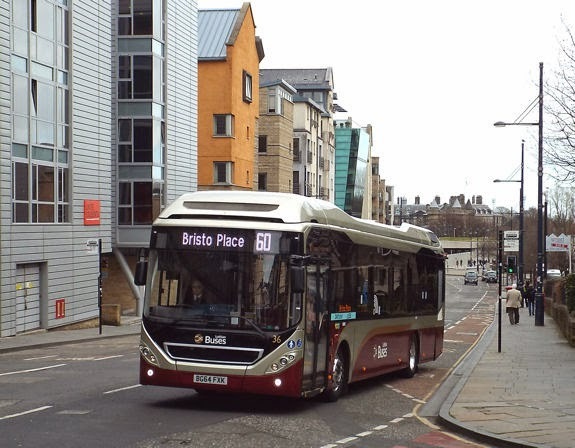 Route X25 is an example of a service which is limited stop, and which also serves a Park & Ride site. In this image, the park-&-ride message has taken precedence over the limited stop description. 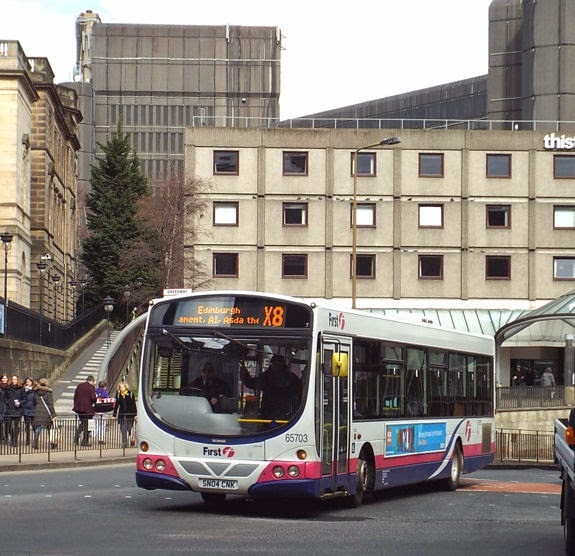 Where a bus is operating only part of the way along a route, a magenta "part route" display is used. 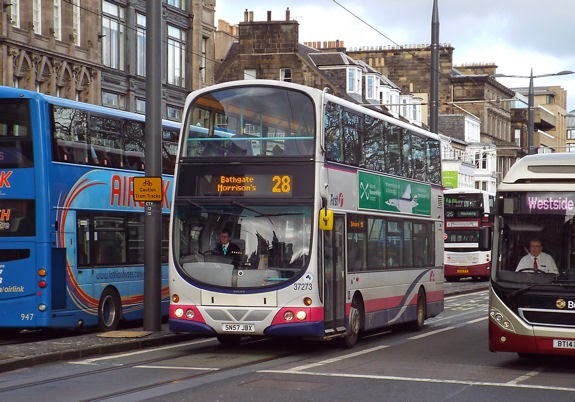 On single-deckers working part route, the display includes a magenta stripe with "part route" as well as the destination. 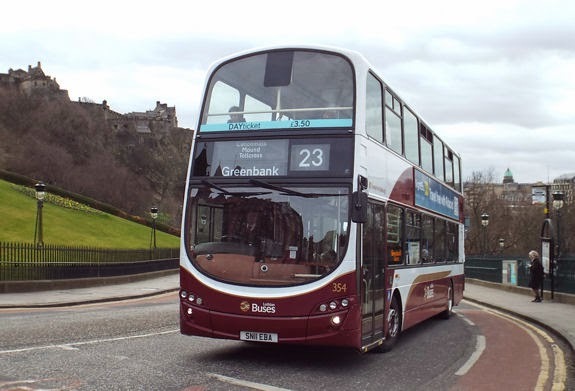 As well as a network of local services, Lothian Buses also operate a dedicated Airlink service between the city centre and Edinburgh Airport. 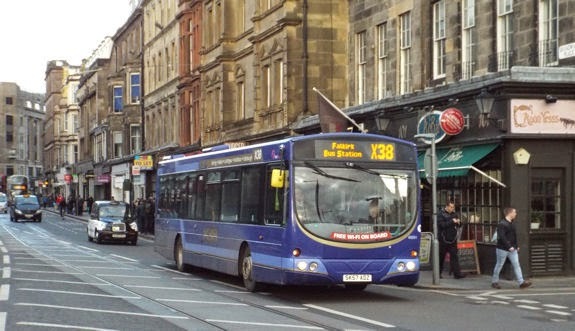 Double-deck buses are used, these carry a dedicated blue livery. 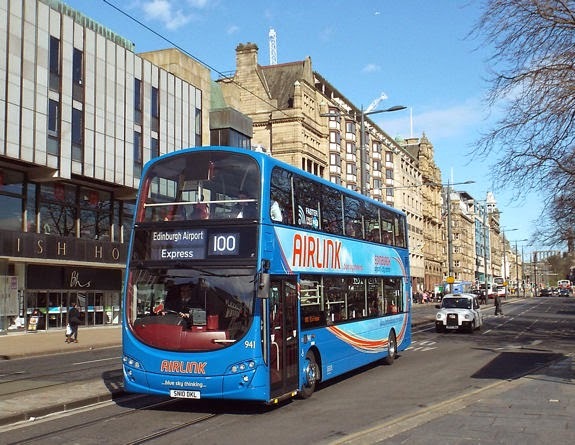 The Airlink service operates at similar frequency to the tram, but at a lower fare of £4.50 per single journey. 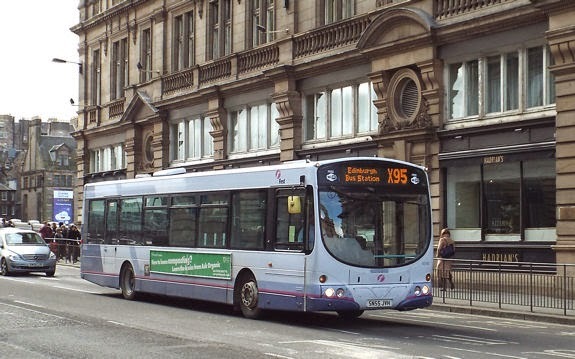 The advertised journey time by bus from the city centre to the airport is 30 minutes, compared to 35 minutes by tram. 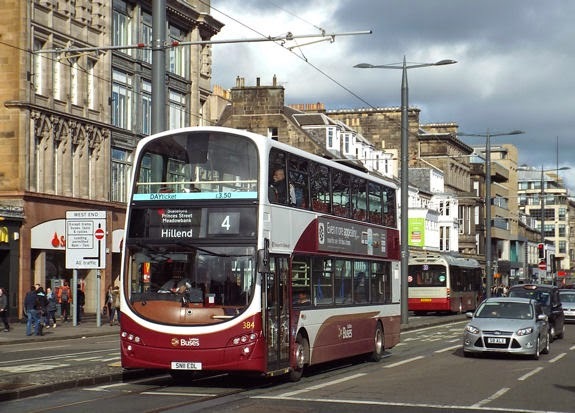 At first sight, it may seem odd that Lothian Buses is competing against (and undercutting) the tram, bearing in mind that both are under local authority ownership. 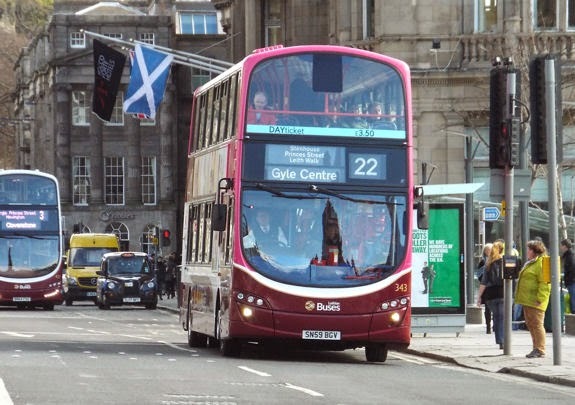 However, bus services in Scotland (and the rest of Britain, with the exception of London) are deregulated. This gives operators commercial freedom to choose when, where and what to operate. 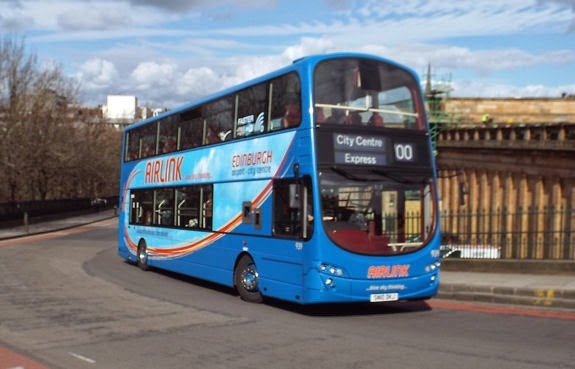 There is nothing to stop another operator running buses between the airport and the city, but the Airlink service may deter them. 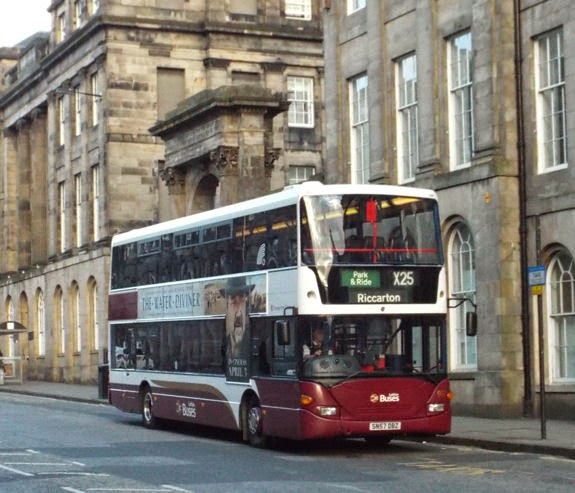 Airlink is not the only Lothian Buses service with a dedicated brand. 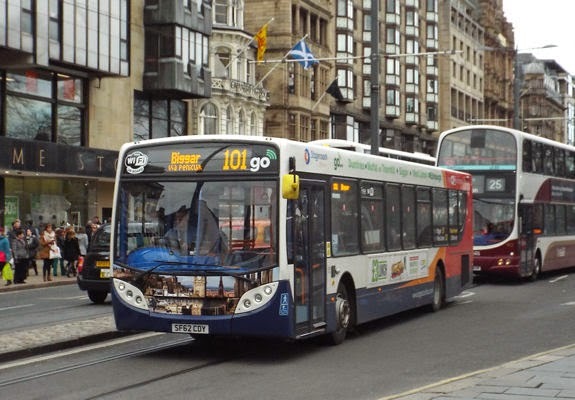 Branding is also applied on certain city routes, at least in theory, with colour-coded buses. 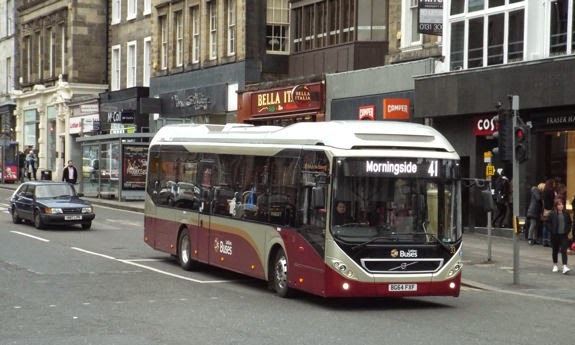 Route 5, which passes through the Morningside district, is branded as "Morningside Maisie". 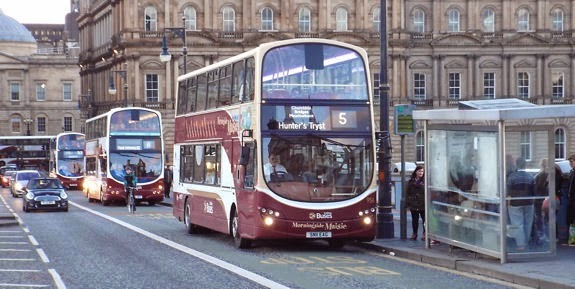 Buses carry a pale beige colour. 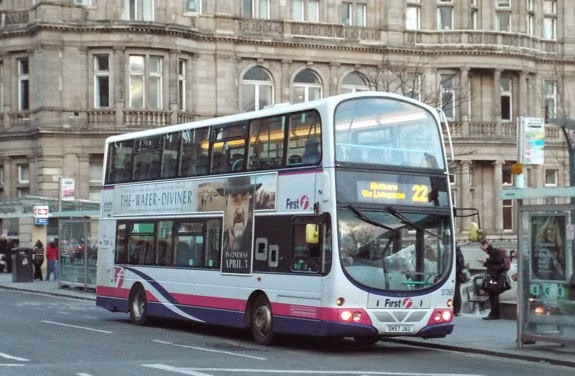 Buses on route 22 carry a pink colour scheme. 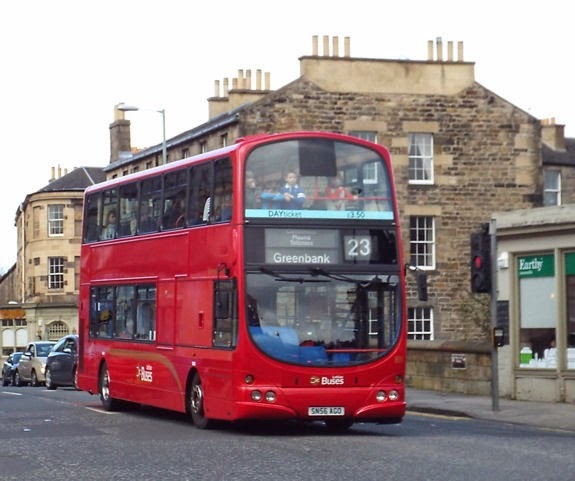 This isn't the only bus route 22 in Edinburgh. 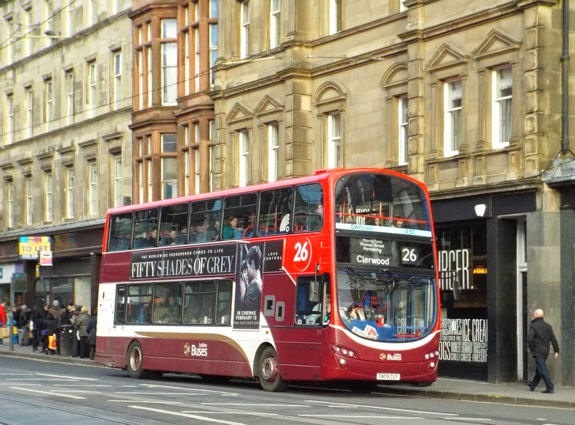 On route 26, the colour scheme is red. 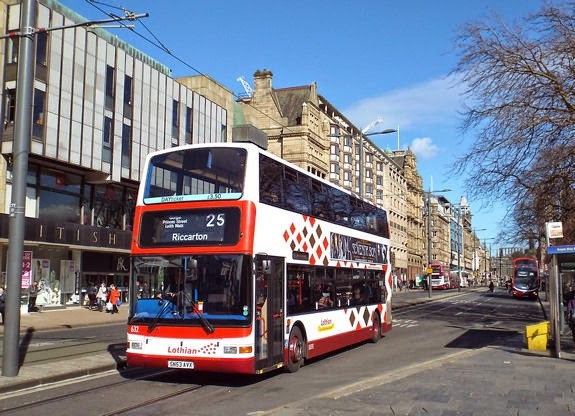 When I visited Edinburgh in March 2015, route 29, was branded as "The Stock Brig" with single-deck buses carrying orange colour-coding. 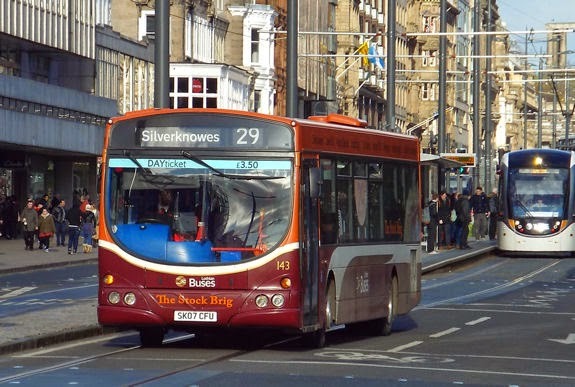 Since my visit the single-deck buses on route 29 have been replaced by double-deckers with similar orange branding. Green is the colour to identify route 36. 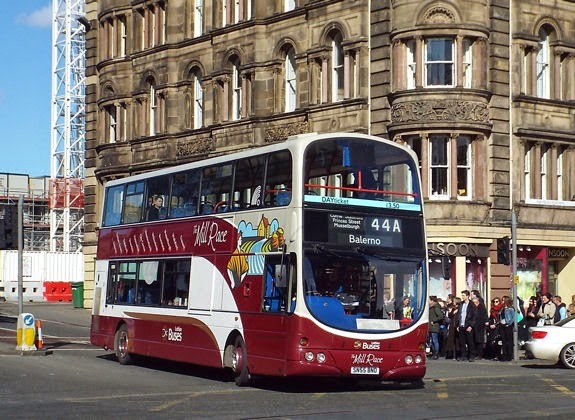 Routes 44 and 44A are branded as The Mill Race, with a greyish colour. 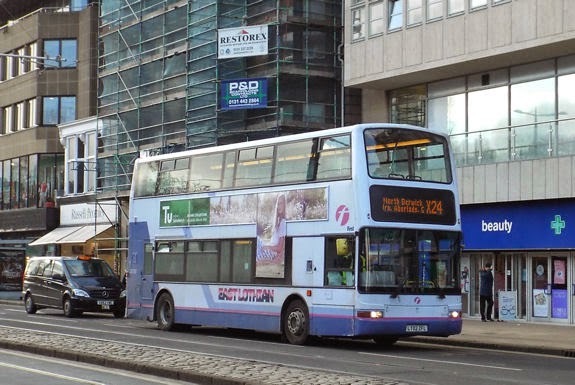 However, on several of these routes, I found buses in standard or "harlequin" livery operating alongside the colour-coded vehicles. 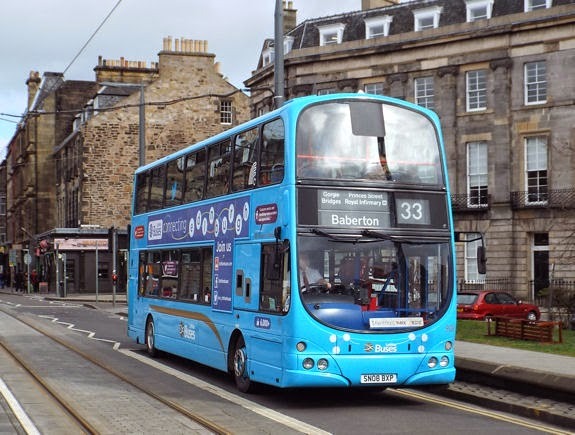 So if you are waiting for a bus on one of the colour-coded routes, it is worth keeping an eye on other buses as well as watching for a colour-coded one. 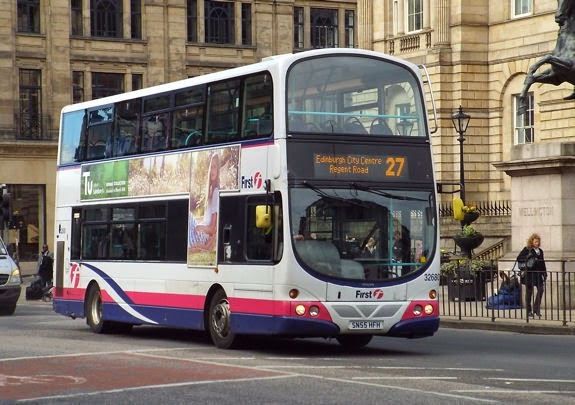 I also spotted a bus branded for route 26 displaying details for route 42. In fact, the bus was out of service when I noticed it. Had it just performed a journey on the 42? I can't be sure. 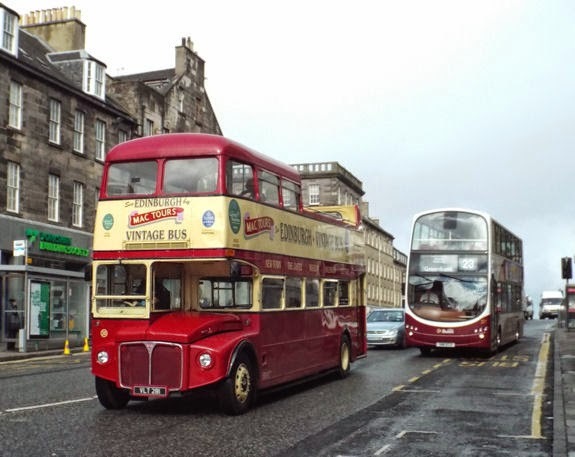 One bus was painted red to mark Remembrance Day in 2014, honouring Britain's war dead. 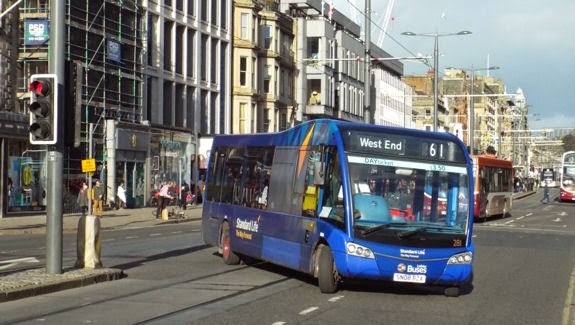 Another bus was wearing a blue livery. 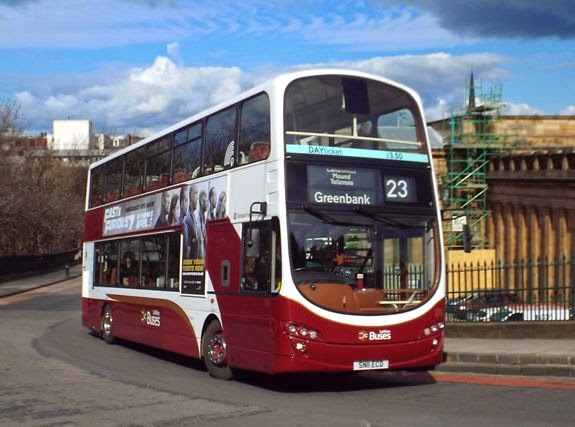 This publicises Lothian Buses' presence on social networking sites. 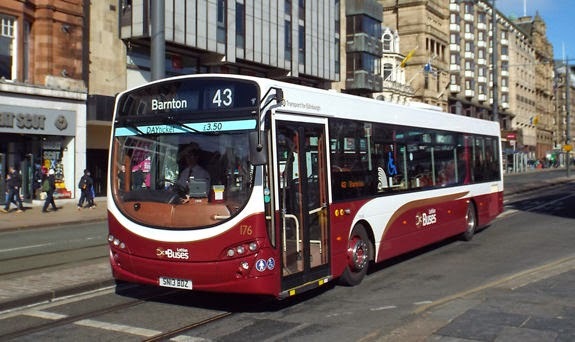 With the exception of the Airlink service and Night Bus routes, fares on Lothian Buses services are £1.50 for a single journey. 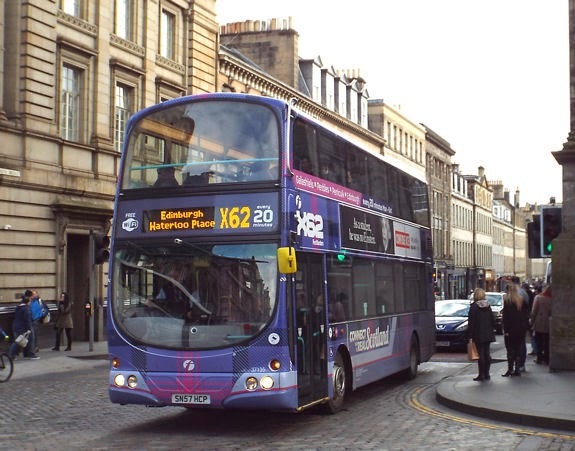 Single journey tickets do not permit interchange so if your journey requires you to change bus, you pay again. 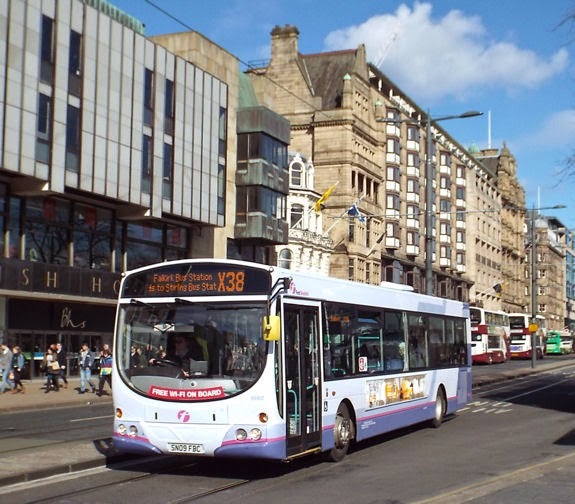 On Night Bus services, which operate between around midnight and 04:00, a higher fare of £3 applies but this allows unlimited travel on the Night Bus network for one night, thus permitting interchanges. An all-day ticket is available, the price has recently increased to £4. 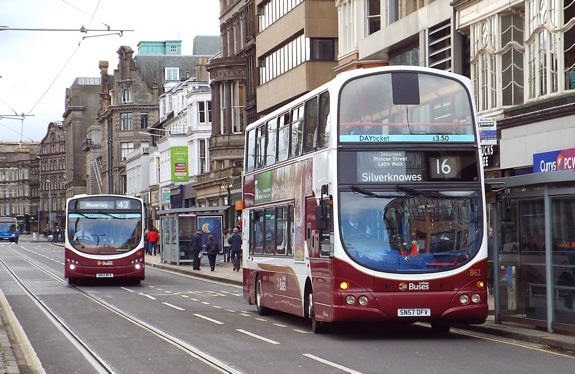 This allows unlimited travel on Lothian Buses (except Airlink) and the trams (except for travel to and from the airport). 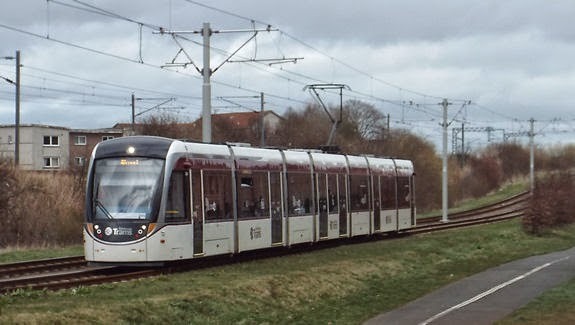 A day ticket which includes Airlink and the full length of the tram system including to and from the airport is available at a higher price. 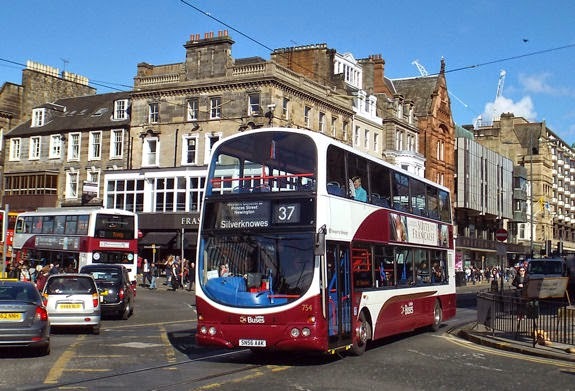 Single and all-day tickets can be bought from bus drivers, although they require the exact fare as they do not give change. 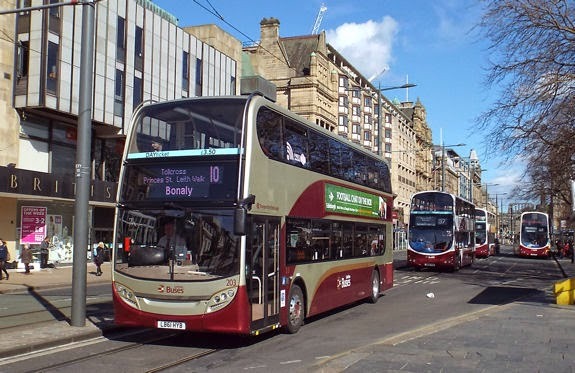 Bus tickets can also be bought in advance in packs; there is also a mobile ticketing app as well as a smartcard which can be pre-loaded with "pay-as-you-go" single tickets. 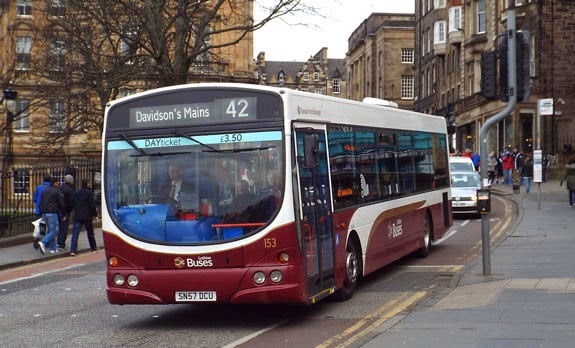 Not all city services within Edinburgh are operated by Lothian Buses. 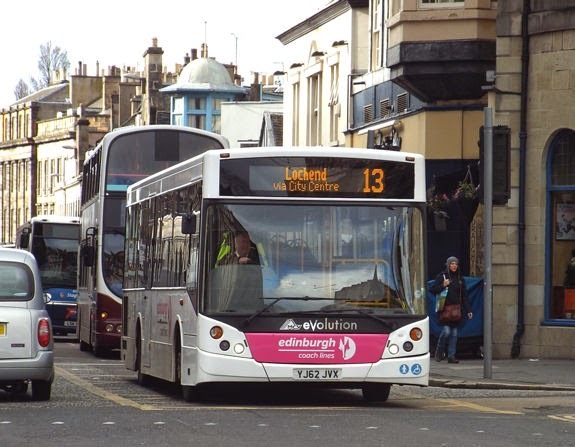 Service 13 is provided by another operator, Edinburgh Coach Lines. 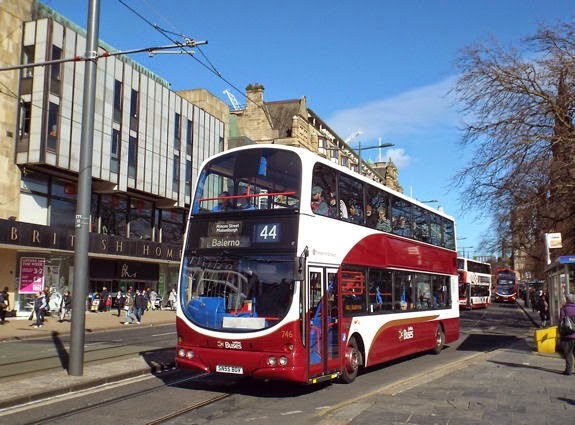 Transport for Edinburgh and Lothian Buses websites only carry information about their own services, therefore it makes no mention of route 13. 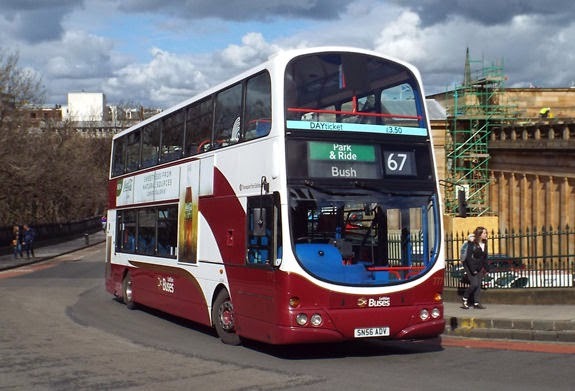 The route has its own dedicated website. 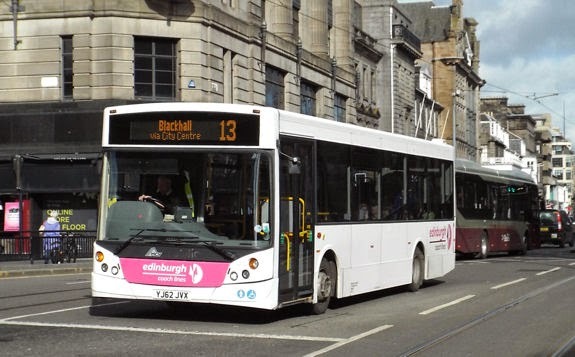 The single fare on Route 13 is £1.50, the same as on Lothian Buses. 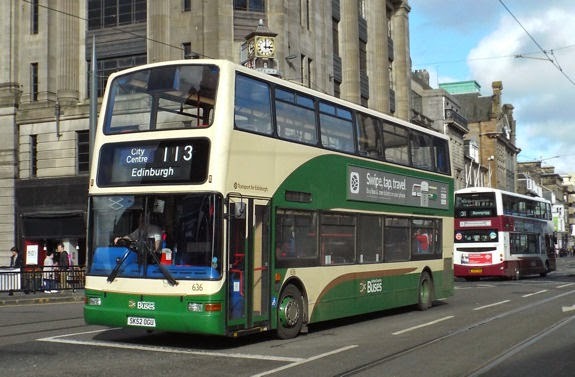 The route has its own all-day and weekly tickets however these are valid only on route 13. 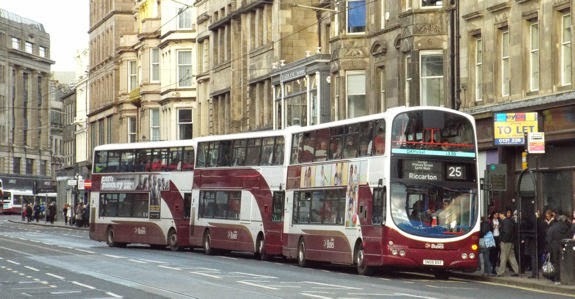 They are cheaper than equivalent tickets for Lothian Buses. 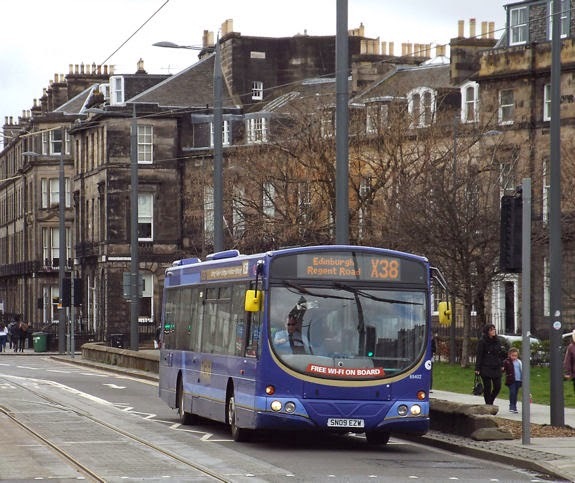 As far as I can tell, Lothian Buses tickets are not accepted on the 13. 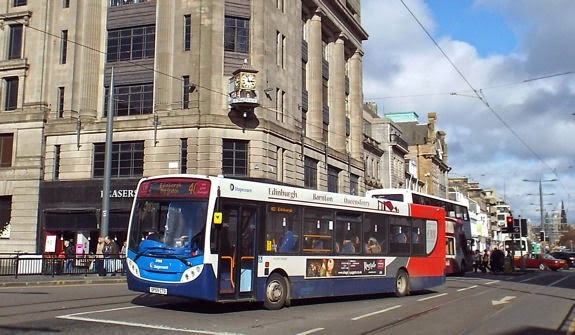 Services extending beyond Edinburgh are provided by a number of companies. 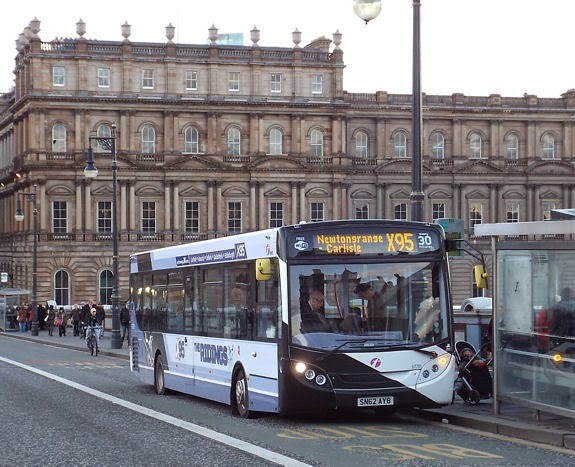 First operate services into the Scottish capital from the west, south and east. 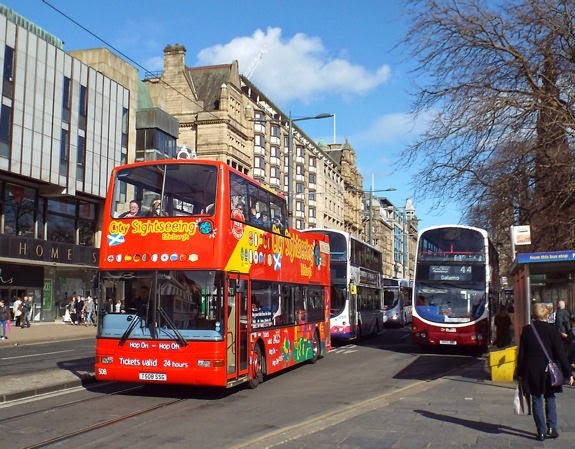 A mix of single-deck and double-deck vehicles is used on these services. 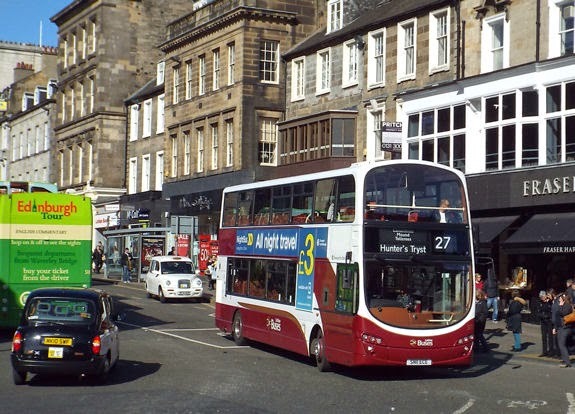 There are two bus routes 27 which operate in the centre of Edinburgh. 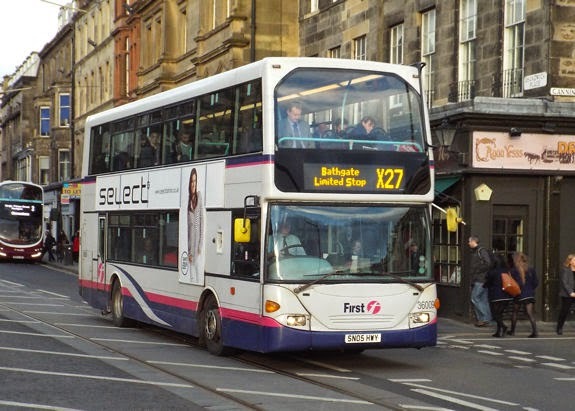 First's 27 bears no relation to the Lothian Buses route of the same number. 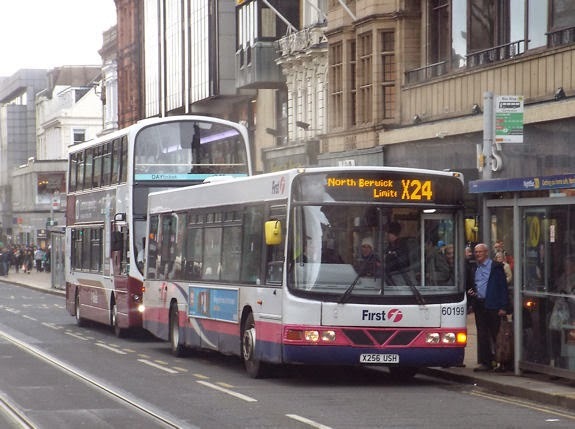 I spotted a couple of coaches operating alongside the buses on First's services. 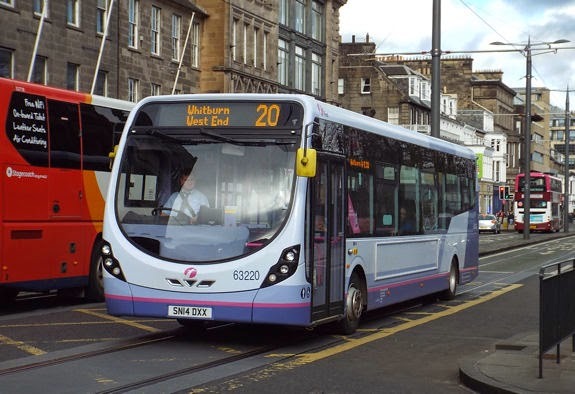 First has introduced distinct branding to a number of its services which run into Edinburgh. 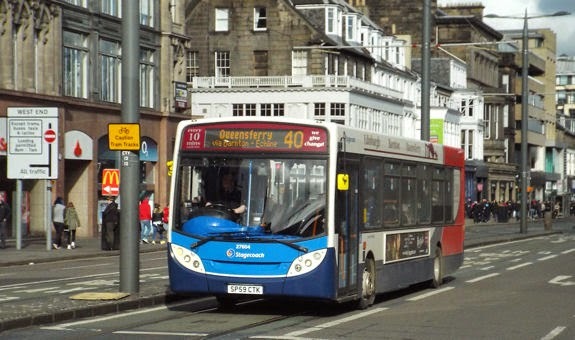 Routes 20, 21, X21 and 22 which head west from Edinburgh to the towns of Livingston and Bathgate are branded as Pioneering Spirit, with a blue colour scheme. 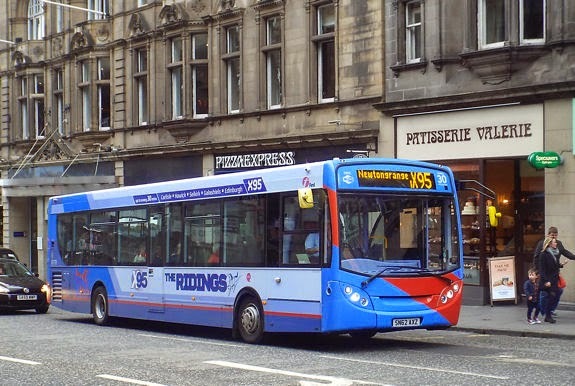 Another route heading west is the X38, to Falkirk and onwards to Stirling. Darker shades of blue are used for the X38 brand. 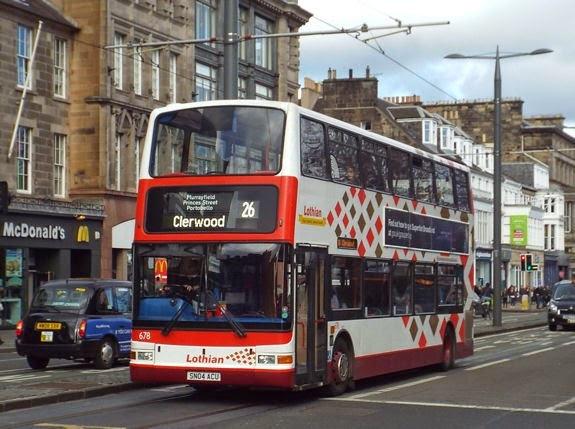 Double-deckers branded with a tartan-patterned livery operate on route X62, which links Edinburgh with the towns of Peebles and Galashiels, some distance to the south. 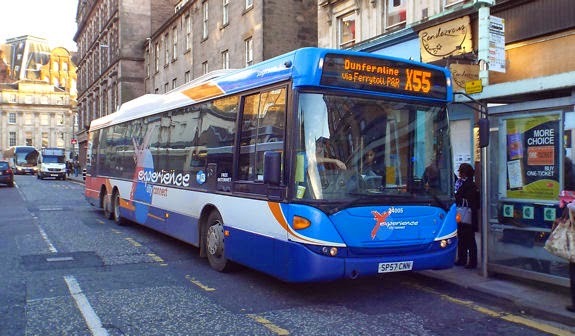 Route X95 is a lengthy route which heads south from Edinburgh into the Scottish Borders region. 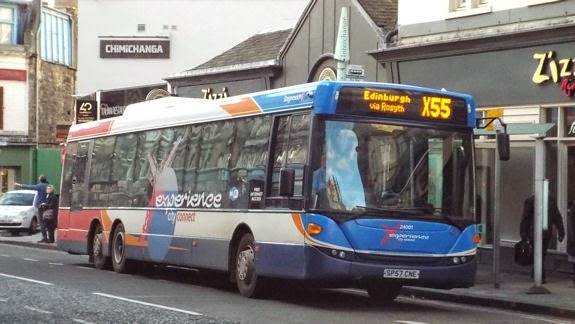 The X95 generally operates half-hourly from Edinburgh to Galashiels, Selkirk and Hawick. 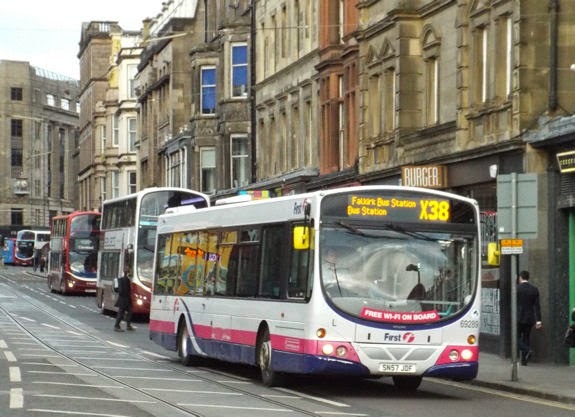 One journey per hour continues to Carlisle, across the border in England. 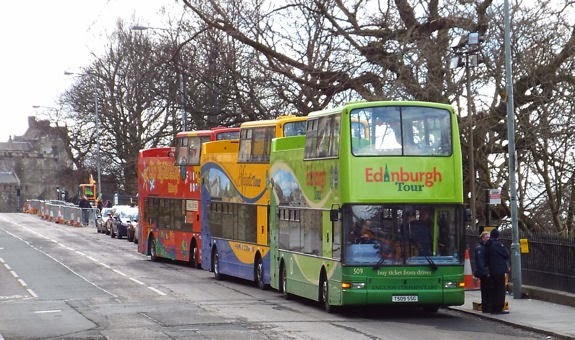 The service is branded as The Ridings, but I noted three different colour schemes being used, as these images show. 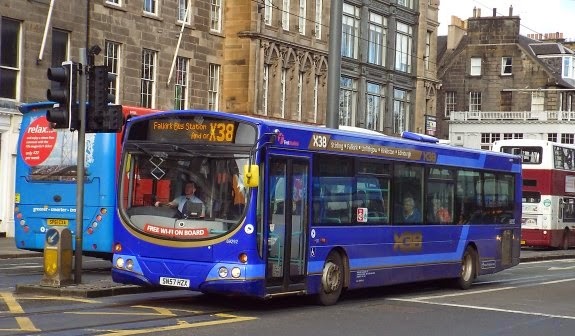 When leaving Edinburgh, I noted the X95 buses display Newtongrange as their destination, with connections to points further south. This is may be a legal technicality. 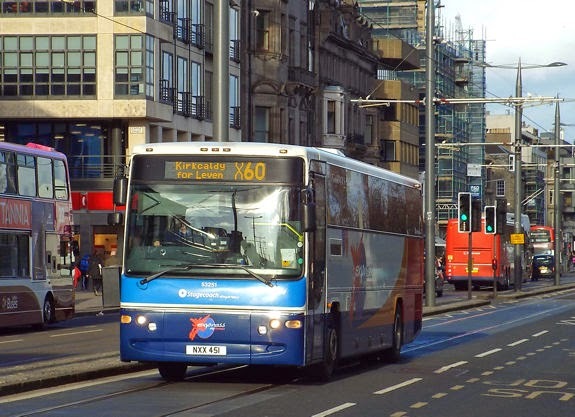 In the UK, bus routes less than 50km in length can be operated under UK domestic drivers' hours regulations, which are more relaxed than the EU regulations which apply to longer distance routes. 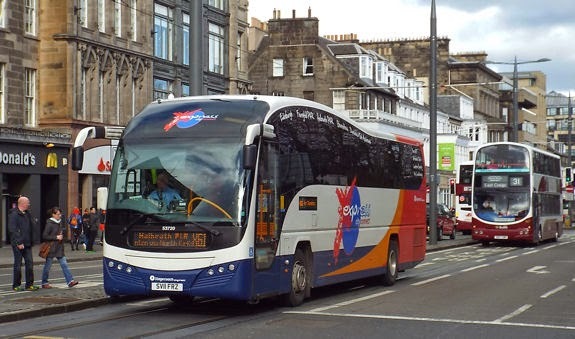 Operating the X95 as a series of connecting legs of less than 50km could enable First to run it in compliance with UK domestic hours rules, rather than observing the EU limits. 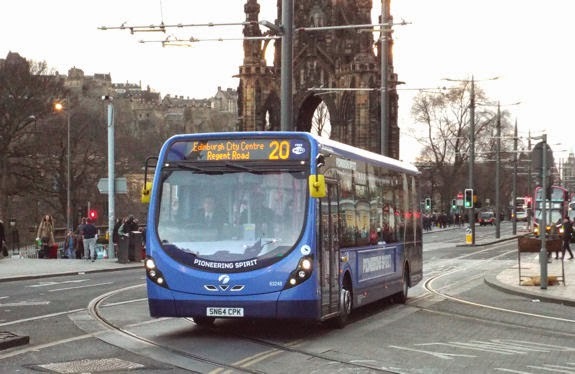 A number of operators in the UK have adopted this practice for services which are longer than 50km. 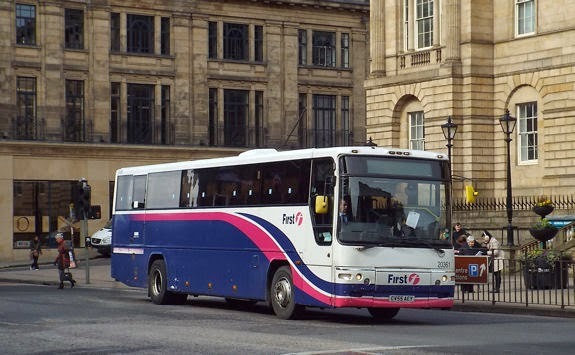 On all of these branded services I saw buses in First's standard colours operating alongside the branded buses. 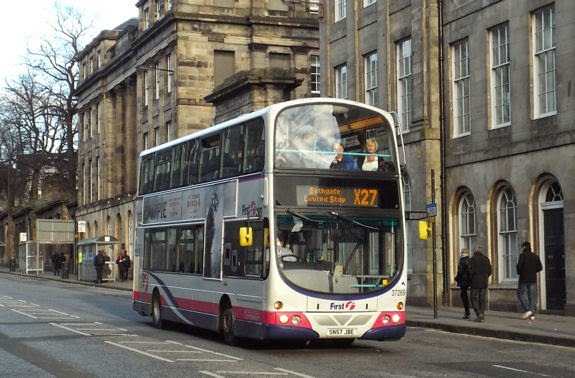 Note that route number 22 is used both by First and Lothian Buses for branded services. 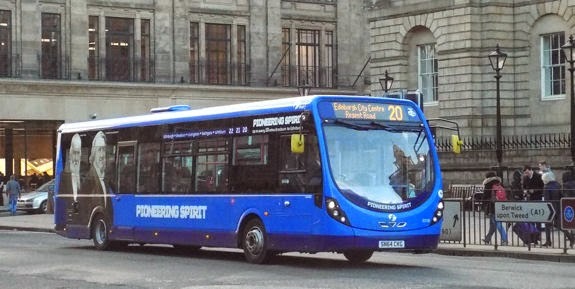 The First 22 is part of the "Pioneering Spirit" brand with blue single-deckers. 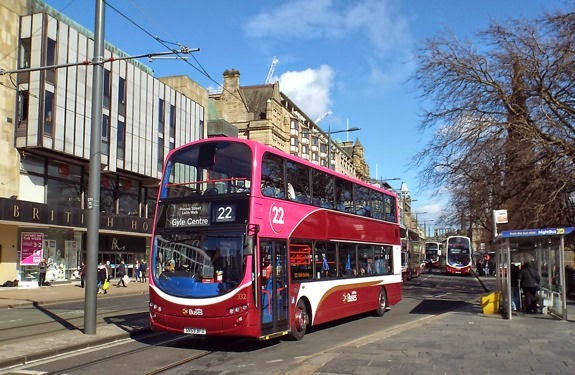 Lothian Buses' 22 uses double-deckers in a maroon, white and pink livery, not to be confused with this white, pink and purple double-decker on First's "Pioneering Spirit" 22! 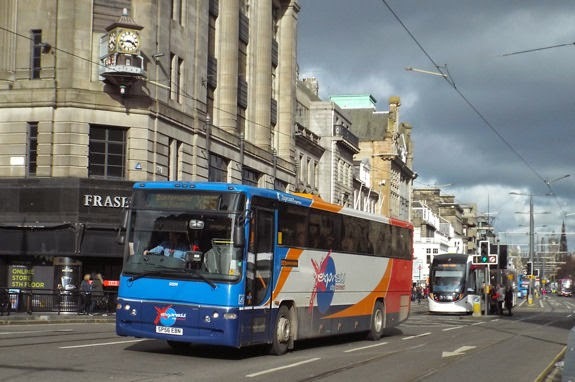 Stagecoach provide services into the Scottish capital from the north. 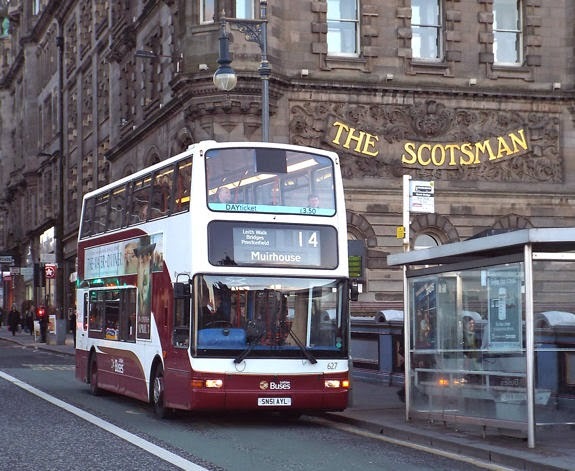 Most of these operate from towns in Fife, crossing the Firth of Forth to reach Edinburgh. 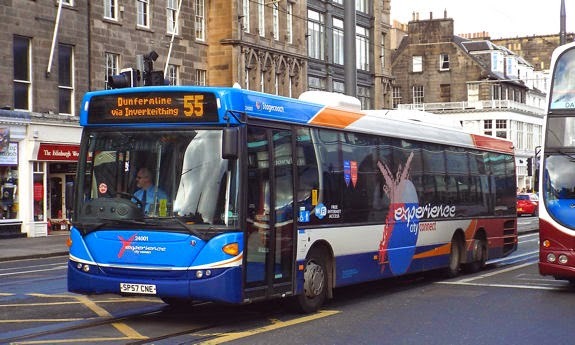 Routes 55 and X55 linking Edinburgh with Dunfermline are generally operated with three-axle single-deck buses. 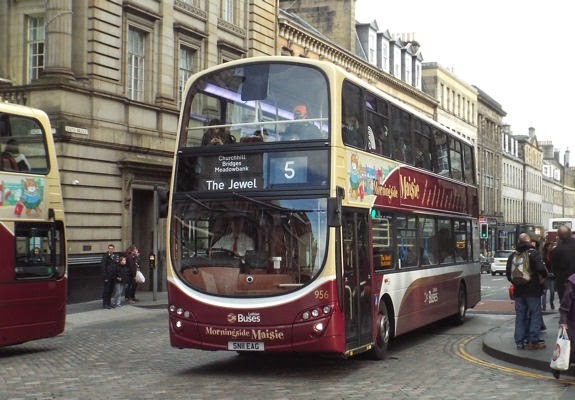 Three-axle buses are relatively uncommon in the United Kingdom. 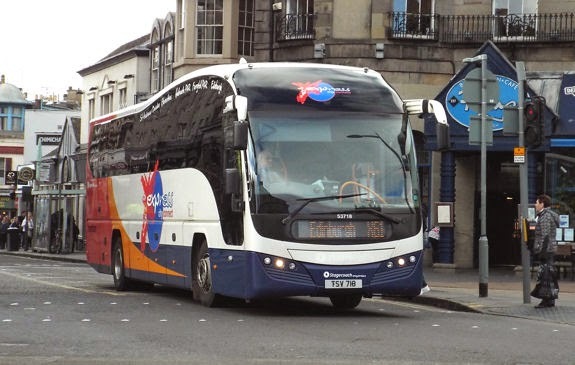 Coaches are operated on other services to and from Fife. 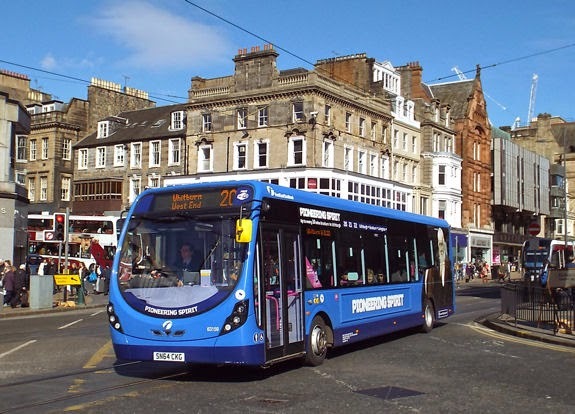 As well as services to and from Fife, Stagecoach also operate a more local service between Edinburgh and Queensferry, on the south side of the Firth of Forth. 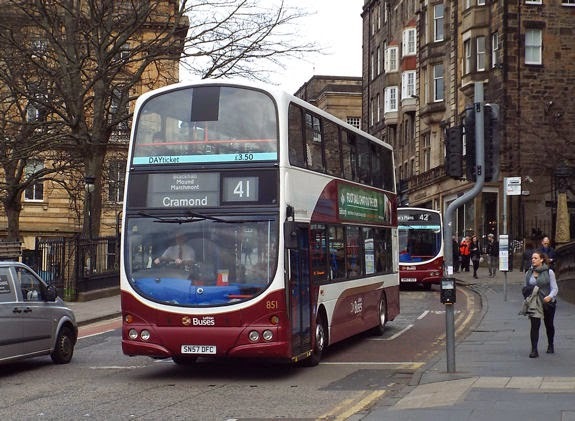 Services 40 and 40A are generally operated by standard two-axle single-deck buses. 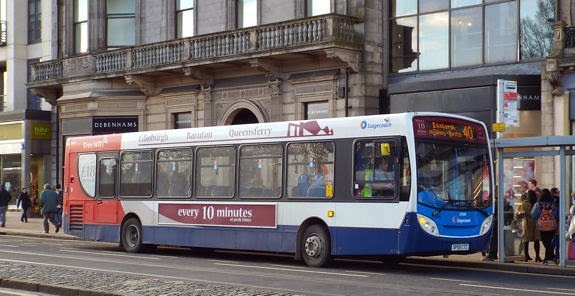 The buses carry limited branding for the Edinburgh to Queensferry service. In addition to the buses with dedicated branding, I did note a three-axle vehicle operating on route 40. 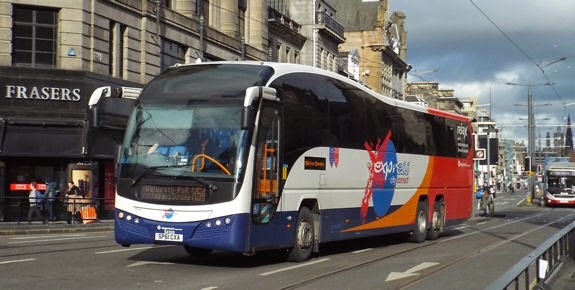 Stagecoach also operate a longer-distance route into Edinburgh from Dumfries, in south west Scotland. 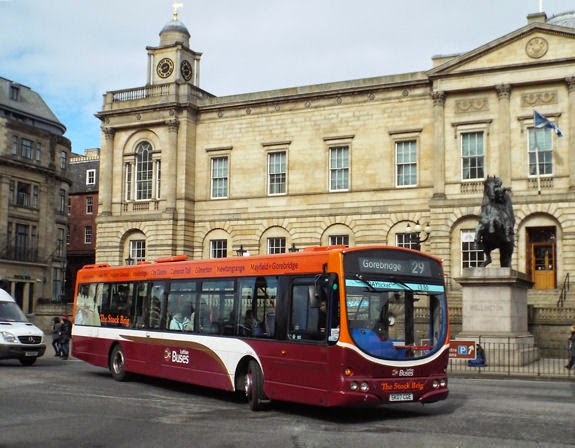 The journey to Dumfries takes three hours, although some journeys run only as far as Biggar, taking a little under an hour and a half. 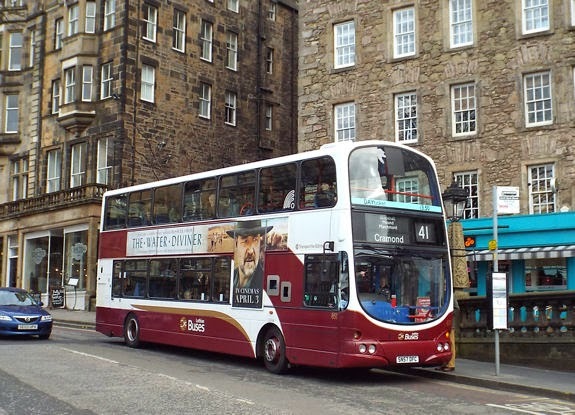 The buses are branded with an image of Edinburgh on the front, as well as route details along the side. 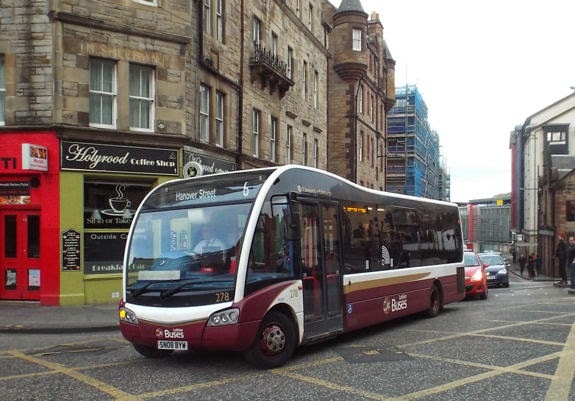 Lothian Country Buses is an offshoot of Lothian Buses. 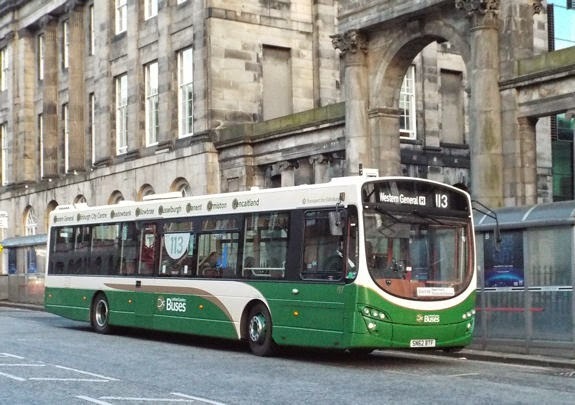 Buses in green and cream colours operate two routes which head eastwards to towns a short distance outside Edinburgh. 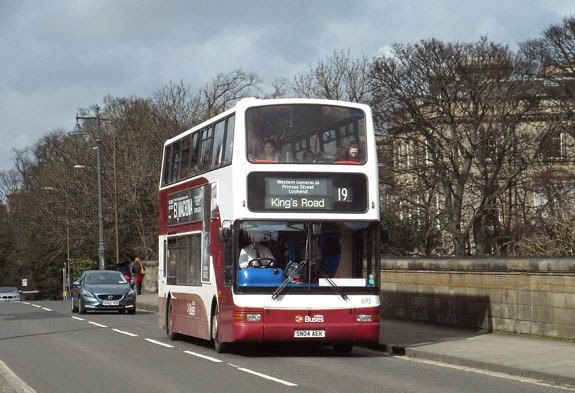 On route 104, linking Edinburgh with Haddington, I observed single-deck buses. 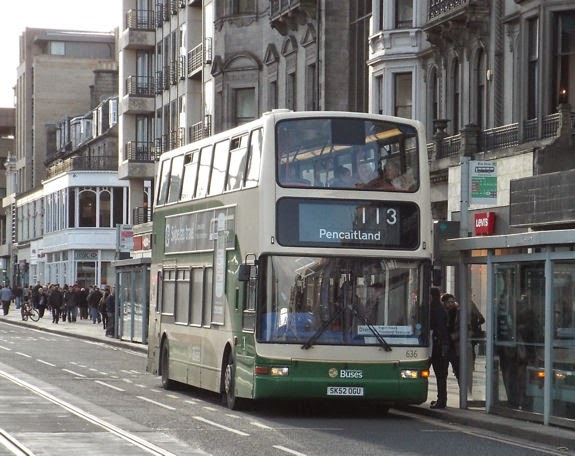 Route 113, linking Edinburgh with Pencaitland, was operating with a mix of single-deck and double-deck buses. 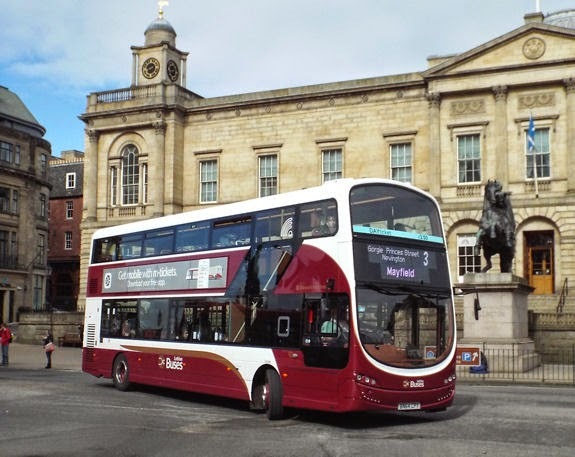 Perryman's Buses is a smaller operator which provides a couple of services from Edinburgh into the Scottish Borders region, to the towns of Jedburgh and Kelso. 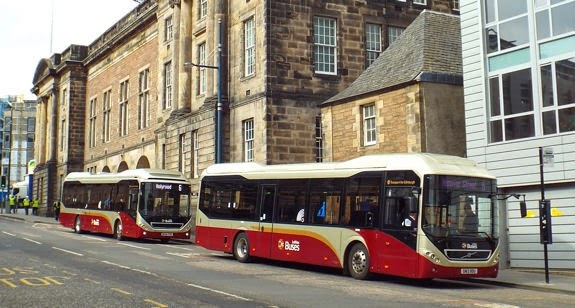 In similar fashion to First's X95, buses leave Edinburgh displaying Lauder as the destination, then on to Jedburgh or Kelso. 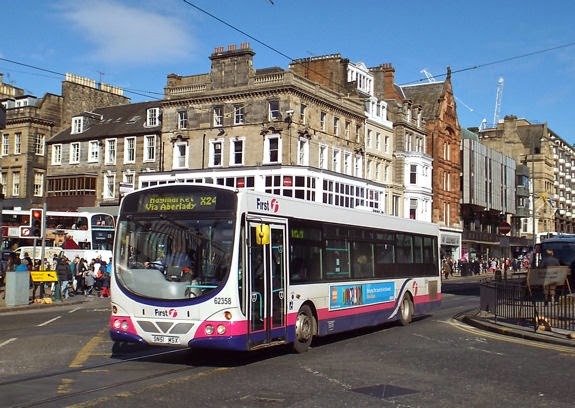 Perryman's also operate a service from Edinburgh which crosses the border to serve England's northernmost town, Berwick-upon-Tweed. 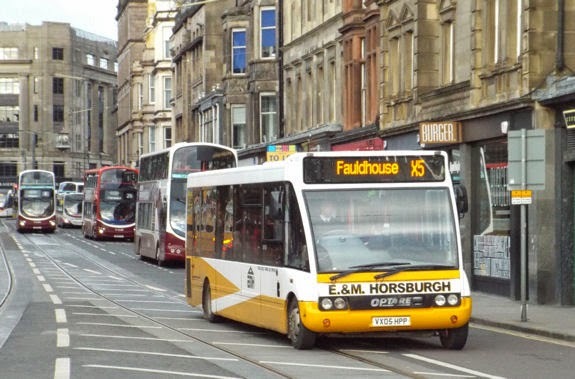 E & M Horsburgh operate a once-daily commuter service into Edinburgh from the west, along with a couple of isolated journeys on routes which are otherwise served by First. I found this midibus in use on the commuter service. 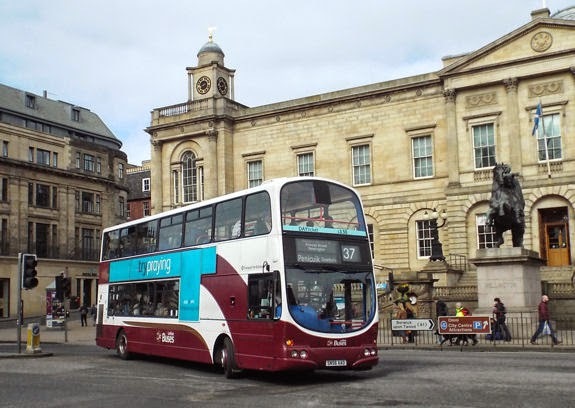 Although Transport for Edinburgh's website doesn't ackowledge bus services provided by companies other than Lothian and Lothian Country Buses, Traveline Scotland provides basic timetables and a journey planner for all of these services, irrespective of operator. Each operator has its own tickets and fare scales. Operators may offer all-day and longer period tickets valid on their own services. 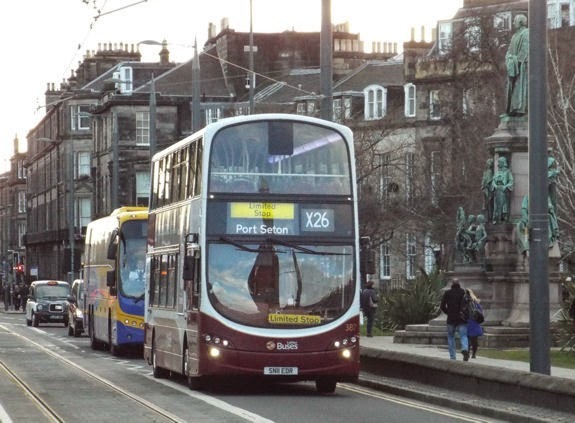 There is a ticket valid on all buses irrespective of operator, but this is not well-publicised (I only became aware of it thanks to a comment left on this post by a reader). 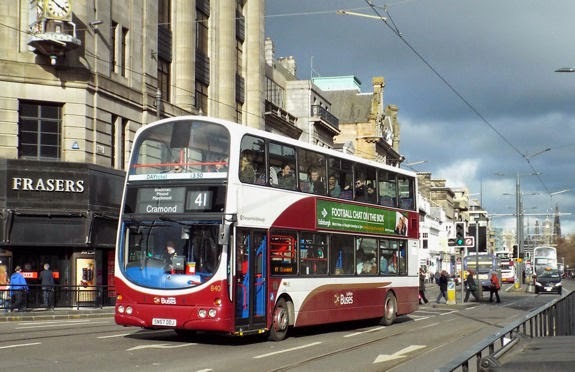 The One-Ticket is a zonal ticket covering not just Edinburgh but a wide area of South East Scotland, available for one day or longer periods. 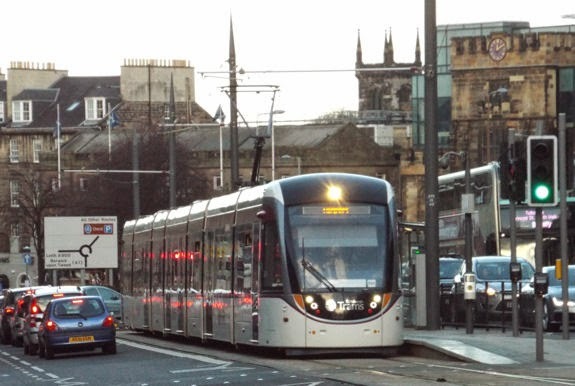 It is not currently valid on Edinburgh's trams. Information is available on the One-Ticket website - but there is next to no mention of it on any of the bus operators' websites. 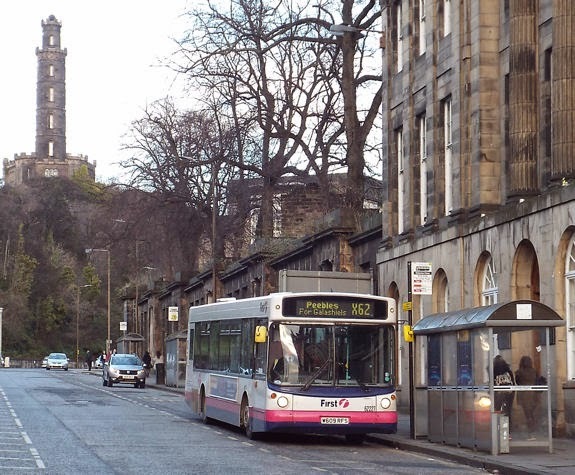 Edinburgh's bus station is the terminus for some, but not all, the out-of town services. 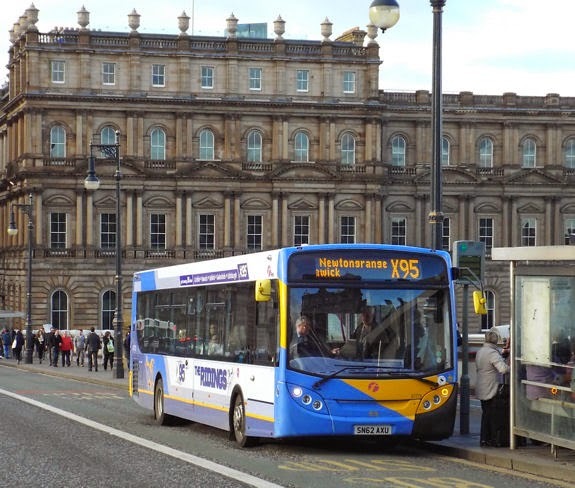 Routes operated by Stagecoach and Perryman's start from the bus station, as does First's X95 service. Other services use on-street termini. 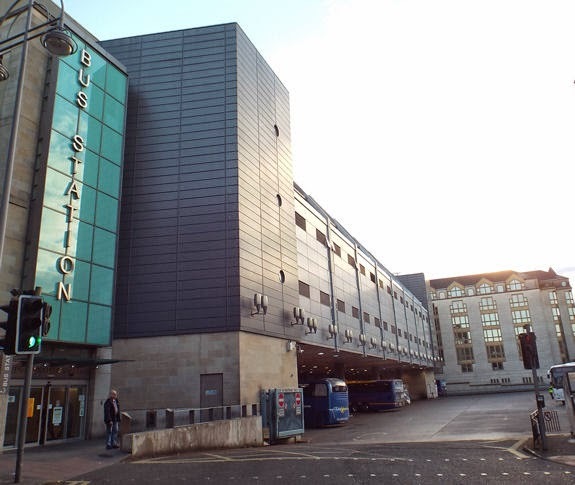 The bus station is also the city centre stop for long-distance coach services serving Edinburgh. 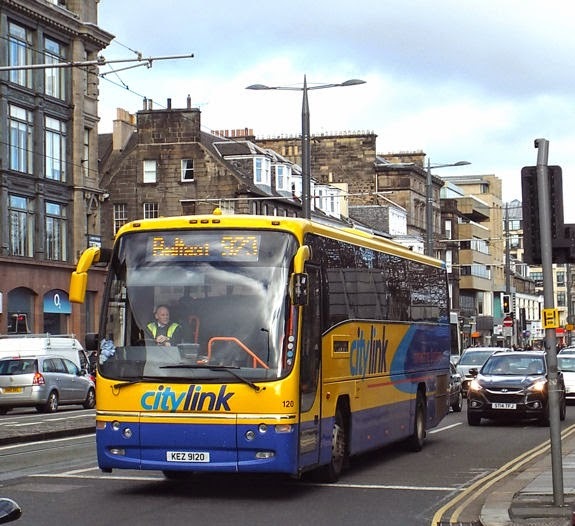 Citylink coaches operate a network of routes connecting towns and cities within Scotland. 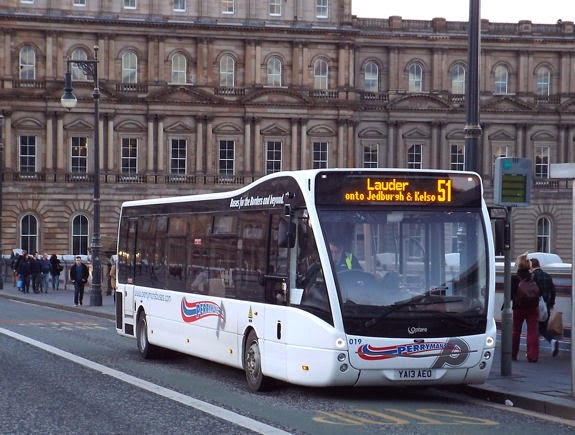 There is also a service to Northern Ireland which operates three times a day. The journey from Edinburgh to Belfast involves a ferry crossing. 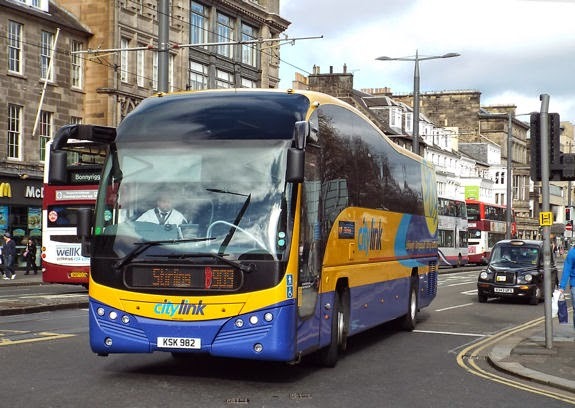 Citylink Gold is a premium-branded service offering more comfortable seating, free hot drinks and wi-fi aboard its coaches. 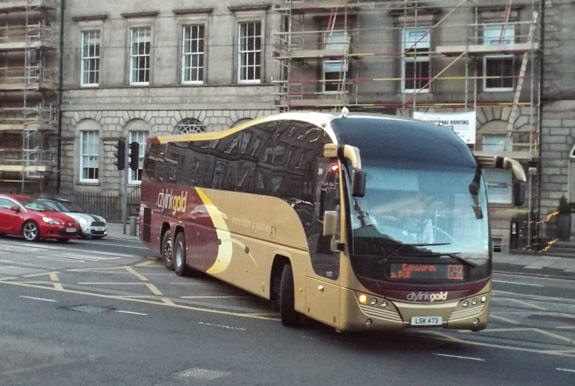 A Citylink Gold service operates three times a day from Edinburgh to Aberdeen. 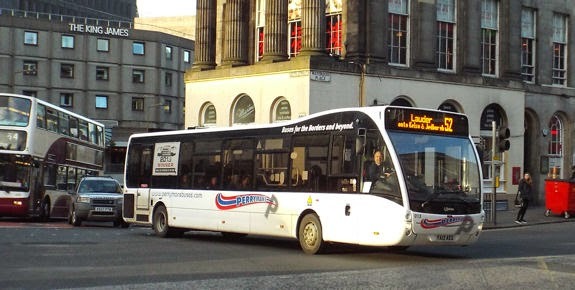 Not all coaches used on Citylink services carry Citylink livery. 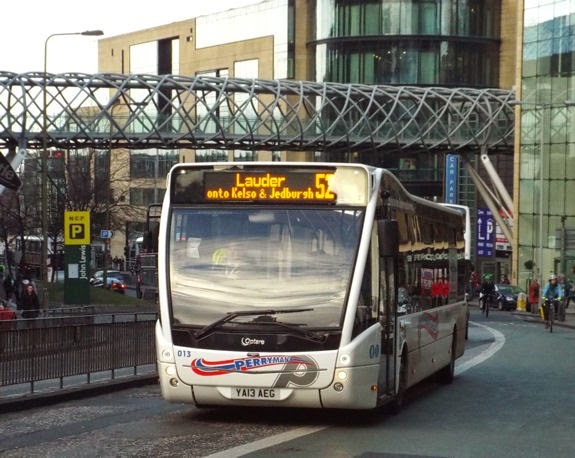 I found a white-liveried coach in use on a Citylink service. 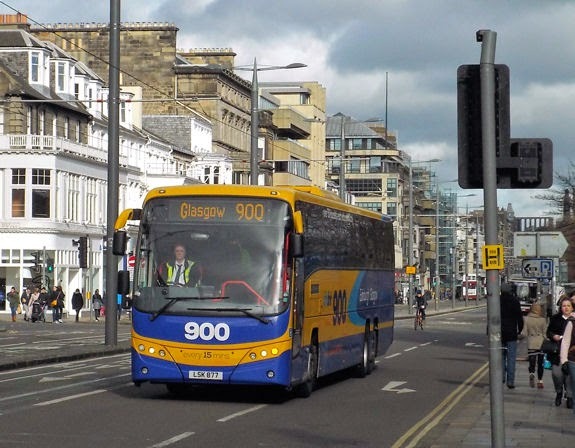 More complex is route 900, a flagship Citylink service between Edinburgh and Glasgow, Scotland's largest city. I observed three-axle coaches on this service. 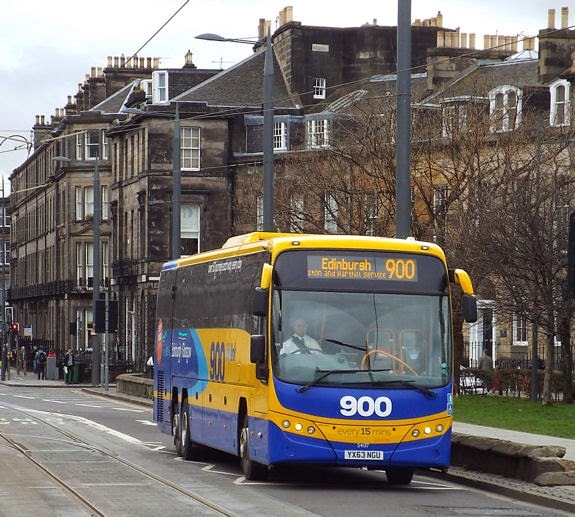 The 900 is jointly marketed by Citylink and Megabus. 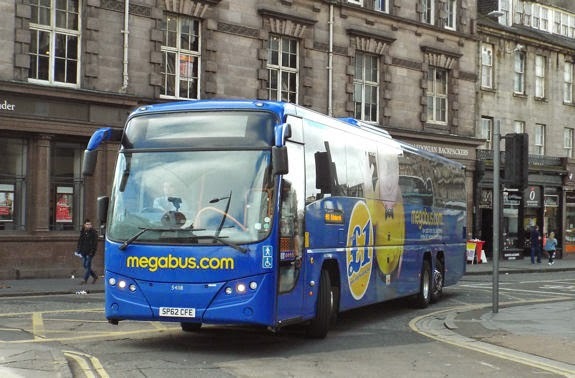 Some of the coaches carry Megabus livery. 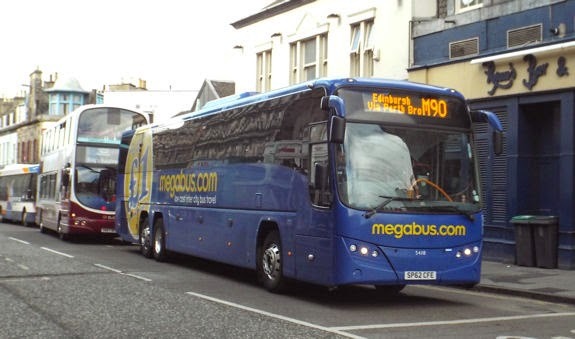 Citylink is part-owned by Stagecoach, who also own the Megabus brand. 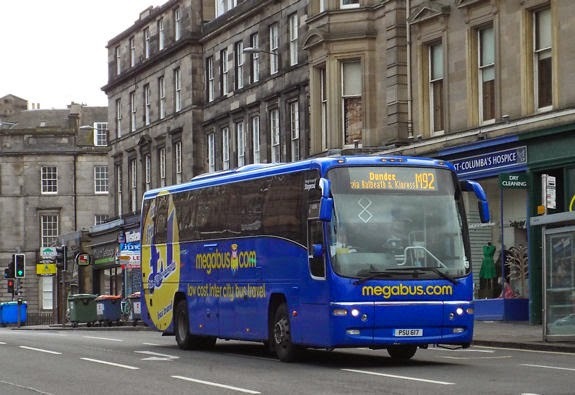 Other Megabus-branded services also operate into Edinburgh. 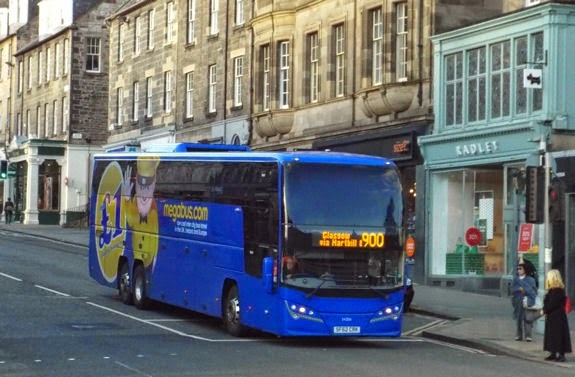 Some Megabus-branded coaches have two axles, others have three. 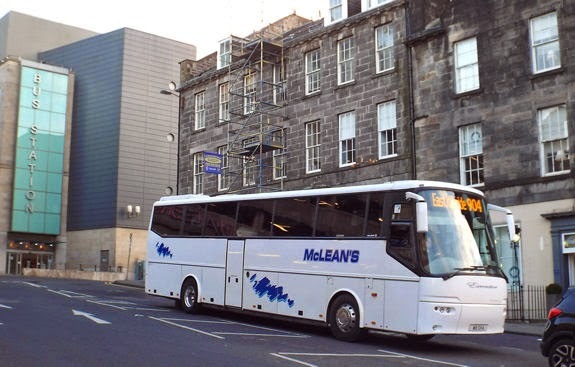 There are also coach services from Edinburgh to destinations in England, including London. 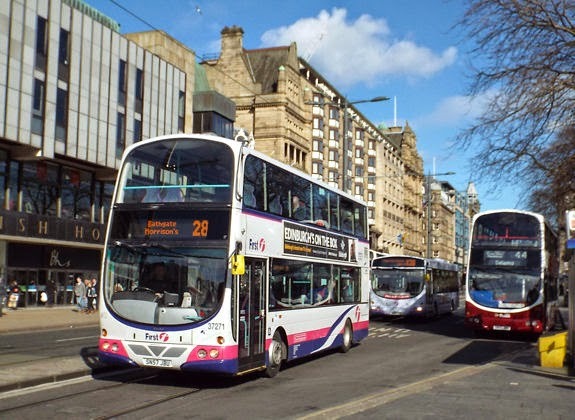 These are operated under the Megabus and National Express brands. 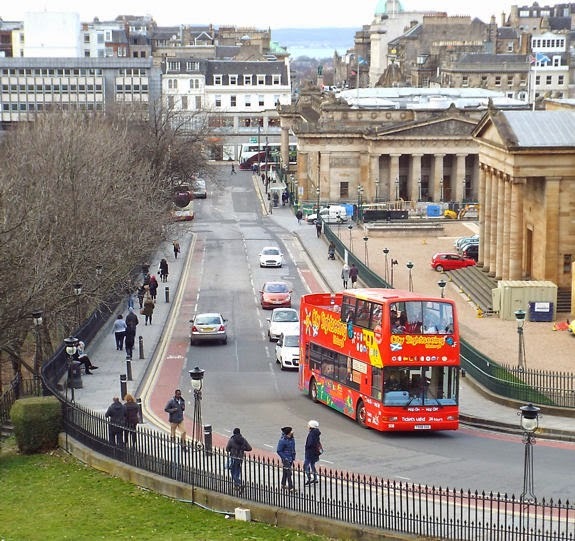 The Scottish capital is a very popular tourist destination, ranking as one of the most visited cities in the UK. 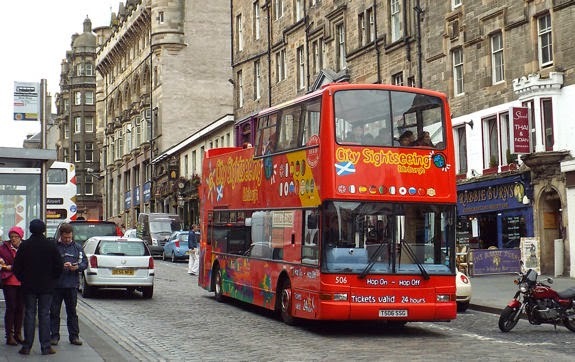 It should therefore come as no surprise that Edinburgh has a choice of sightseeing tours. 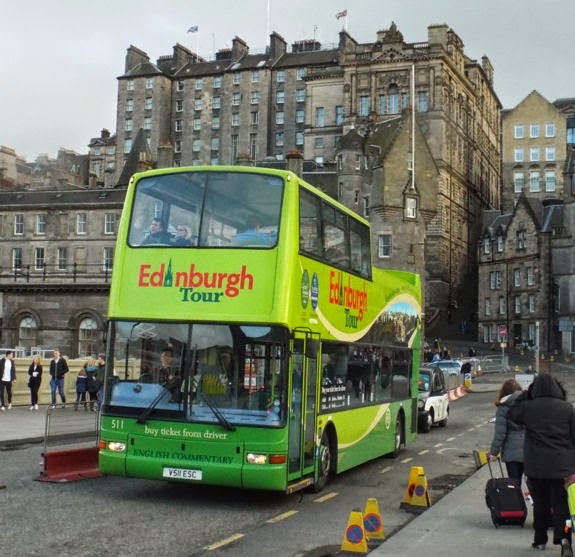 The main start and end point for most of the tours is close to the entrance to Edinburgh Waverley railway station. 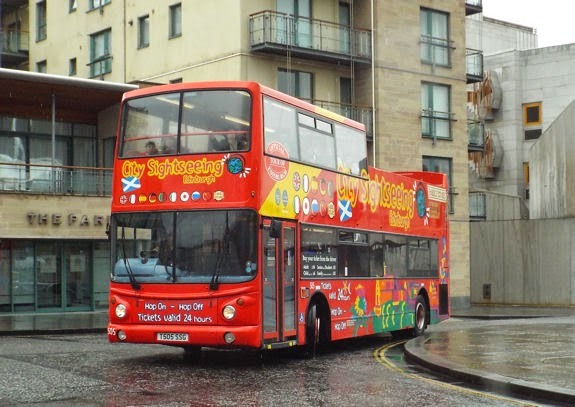 The City Sightseeing tour offers a hop-on, hop-off tour of the sights of Edinburgh city centre. A recorded commentary is provided in ten languages. 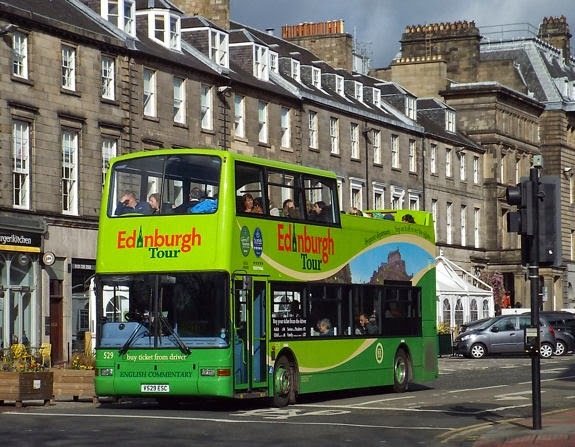 A similar hop-on, hop-off tour operates as the Edinburgh Tour with buses in a green livery. The key difference is the commentary, which is provided (in English only) by a live tour guide. 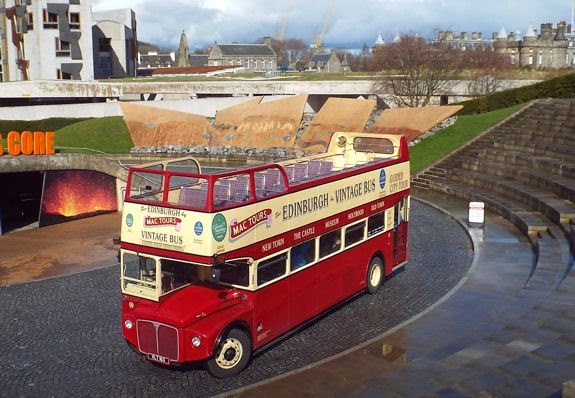 The Majestic Tour, with a multi-lingual audio commentary, provides a hop-on, hop-off tour combining the sights of the city centre with the botanic gardens and Leith Docks to the north of the city. 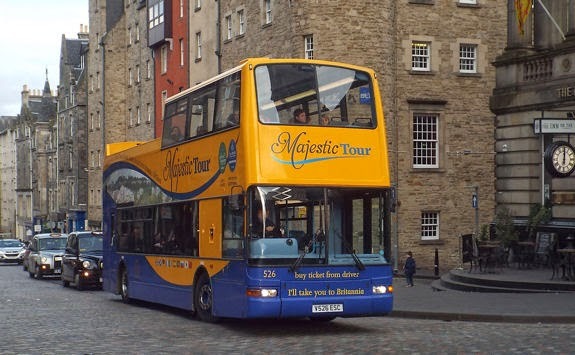 The City Sightseeing, Edinburgh and Majestic Tours operate all year round. 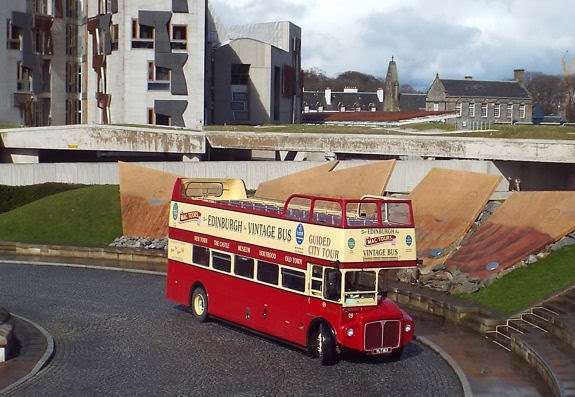 During the Spring, Summer and Autumn, they are joined by a vintage bus tour named Mac Tours. 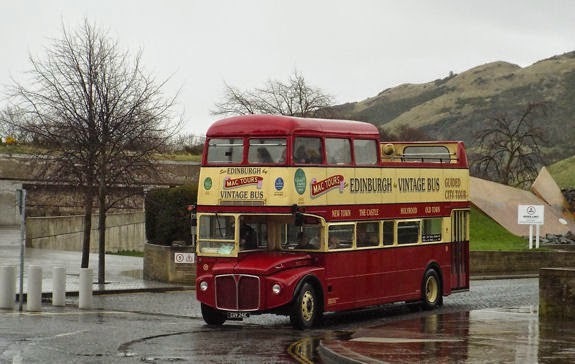 This uses a number of Routemaster buses which had been retired from service in London. Commentary is provided in English by a live guide. 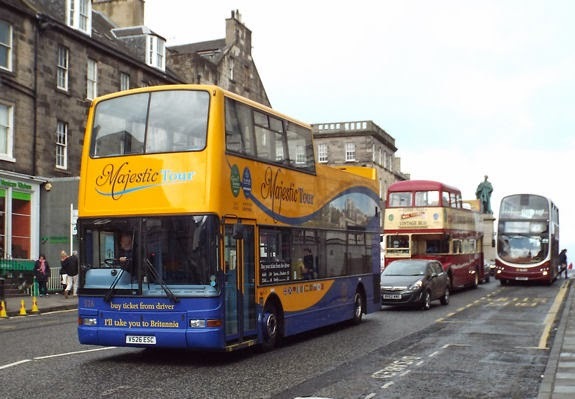 These four tours are all marketed and operated by Lothian Buses. 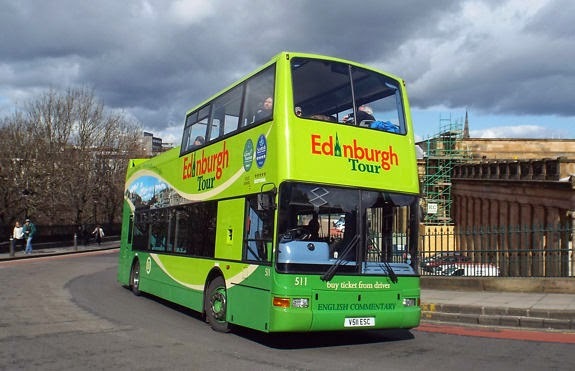 In addition, a Bus & Boat tour to the Forth Bridge and the Firth of Forth operates 2-4 times a day from Spring to Autumn. There is one further tour, which is marketed and operated by another company. 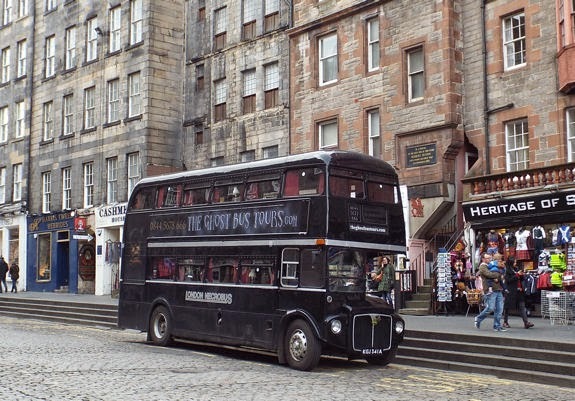 The Ghost Bus Tour operates in the evening, but I found the bus advertising itself around Edinburgh during the daytime. 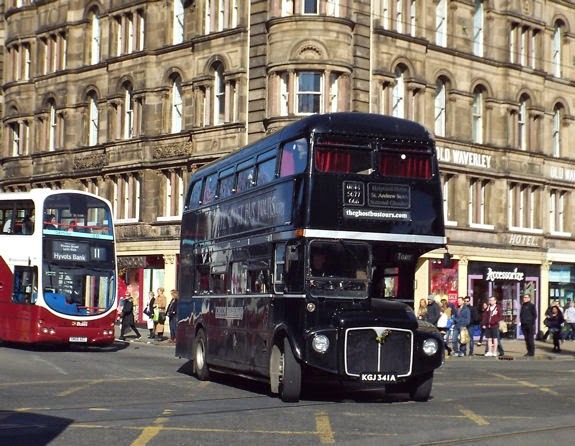 The bus is another Routemaster retired from service in London. 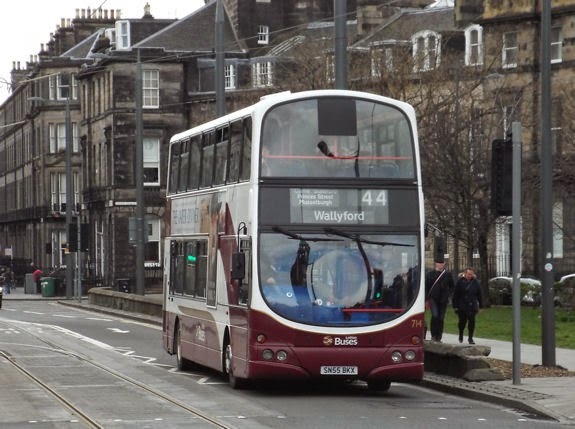 In closing, I would like to thank Simon Wallis of Transport for Edinburgh for his help while I was visiting Edinburgh and its transport system. 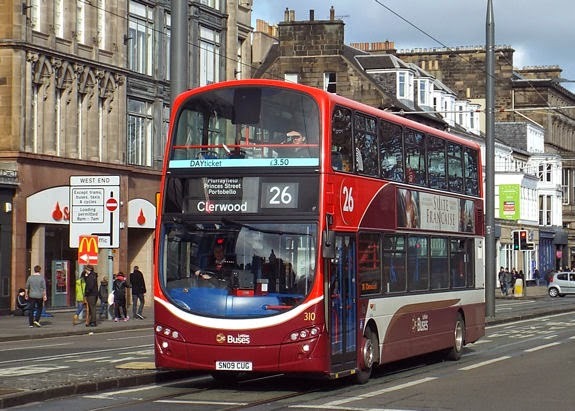 You might be interested to know that there is an all-operator day and season ticket for Edinburgh (and indeed for ever expanding circles covering most of South-east Scotland), but for some reason there's almost no publicity for it. 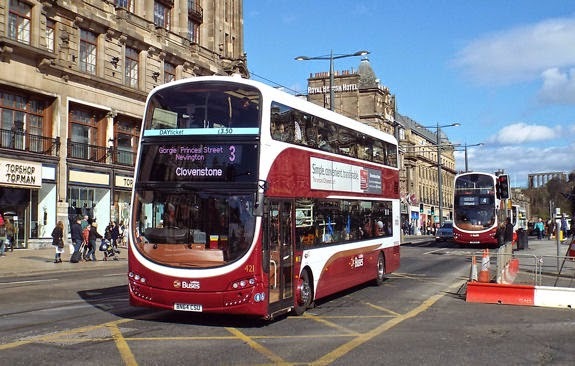 It's called the "One-Ticket" and details are at http://www.one-ticket.co.uk, although it's not the most user friendly of websites - I find it's best to start at the maps page http://www.one-ticket.co.uk/maps.html and only then look for prices! Many thanks for that, I have corrected the post. 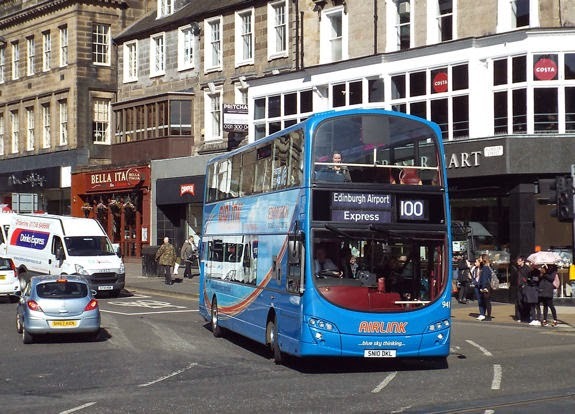 It does appear short-sighted (and not particularly cusotmer-friendly) that, although the operators publicise their own tickets on their websites, they show less enthusiasm for promoting a ticket which offers passengers a wider choice of services to a wider range of destinations. I knew I should have dug a bit deeper when I spotted a passing reference on the Service 13 website to One-Tickets being accepted! 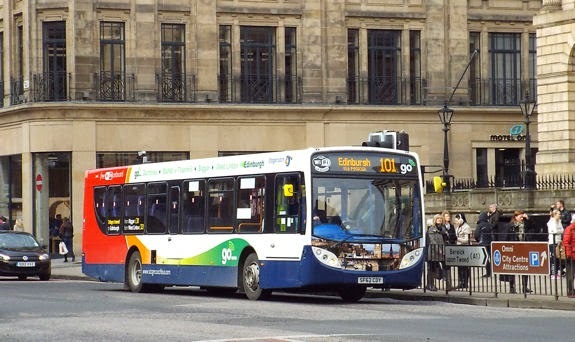 Having rail staff travel discounts (which influences my choice of travel mode), I tend to use Plusbus tickets quite a lot when out and about rather than locally organised tickets or passes, and it's often surprised me how little reference there is to that scheme on many transport websites, both those of the operators and also those of organising authorities such as PTEs. 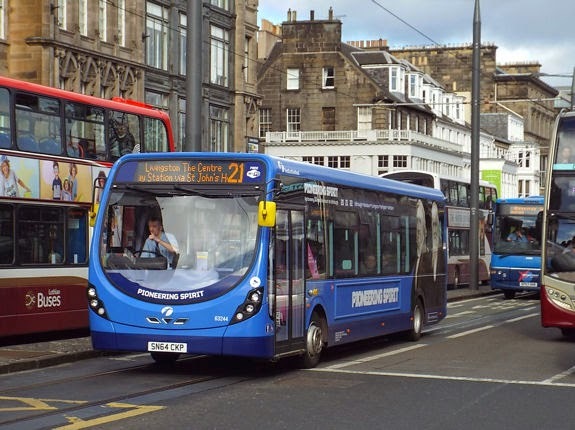 It's a shame, but I suppose understandable, that the commercial operators should prefer to publicise their own products than any multi-operator products for which they'll presumably get a lower revenue share, but I do I think it is short-sighted of them as the ability to travel on multiple operators makes public transport more attractive to visitors (or indeed local residents) who may otherwise stay in their cars or jump into taxis as an easy (if pricy) alternative. 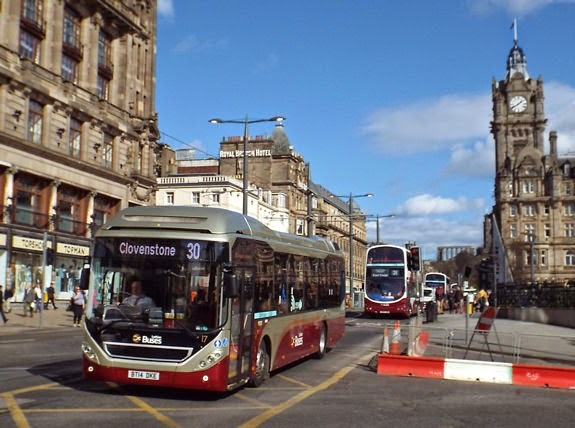 As for the councils and other funding authorities; I really don't understand the apparent unwillingness of many councils to promote the very transport they're funding. 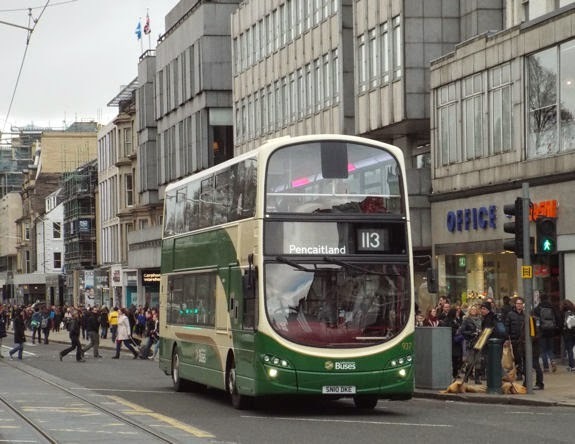 This blog is a collection of personal observations of bus and tram systems on the streets of places I have visited, in the UK and abroad. I might occasionally stray onto other forms of transport - metro or suburban rail, sometimes ferries too, along with the occasional cable car or funicular. The blog seeks to illustrate what I have found on my travels. 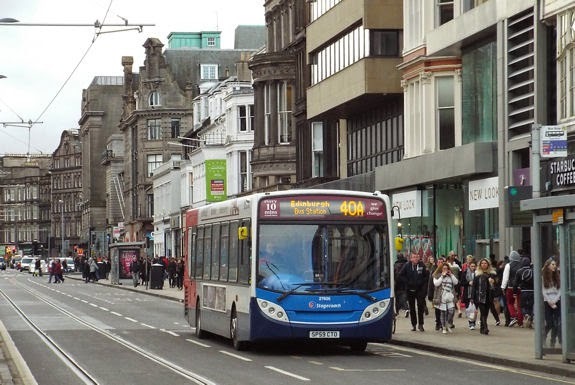 Maybe it will challenge some popularly-held myths about why transport in the UK has to be different to what they do elsewhere. Maybe it won't. I can but hope that someone, somewhere, will find it interesting. The places which will feature here are a random collection, towns or cities, most of which I happen to have visited while travelling. Very few are places I have visited specifically to observe their transport system. Each post is a snapshot in time, reflecting what I found when I visited the places I write about. As time passes, the information may no longer be up-to-date. Views expressed here are, of course, entirely my own personal opinions. Self-confessed transport geek, who has worked in various sectors of the public transport industry. 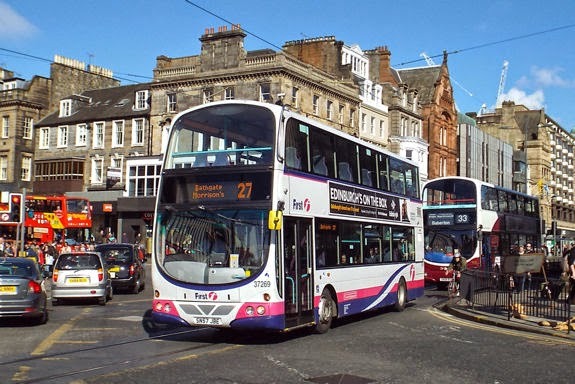 For me, transport is about people and places - moving the former by connecting the latter.